My biggest regret in life is not being able to spend more time on our content, and our Stories more specifically. I mean, an extraordinary amount of effort and research already goes into producing these articles, I’m sure most of you would be well aware of that, but I would love to be able to give each Story even more love. To workshop the titles, to go even deeper with some of the projects, present additional insights, ninja-fy the layout etc. Alas, the digital world is brutal and we simply have to keep moving. Plus I have to keep reminding myself not to overwhelm you with too much content, as there is only so much you can take in each day. Am I right or am I right? Thank you. I do love being right, you know. But this random tangent is, of course, not the topic of today’s discussion. 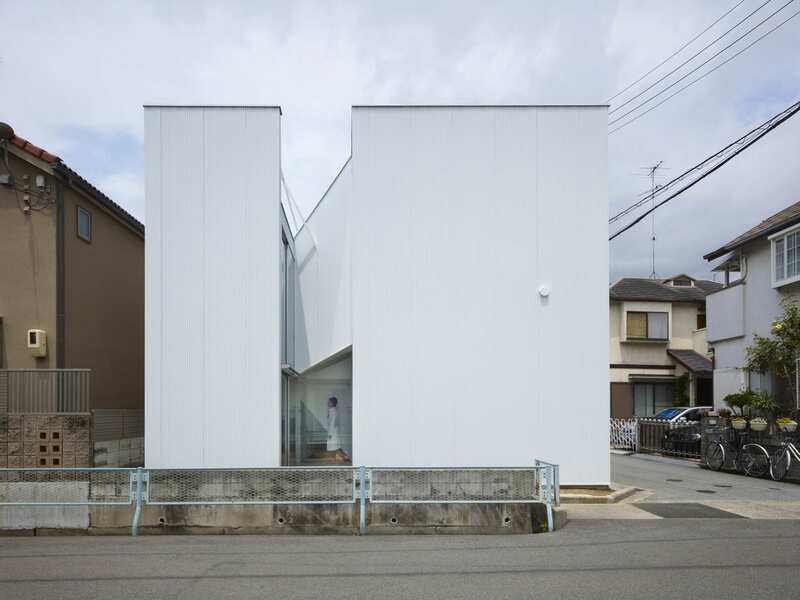 We are here to talk about serious architecture. Sliced architecture to be exact. What do I mean by that, I hear you ask? Well, this is the bit where I wish I could spend more time on working through the titles to nail the intent of each Story. 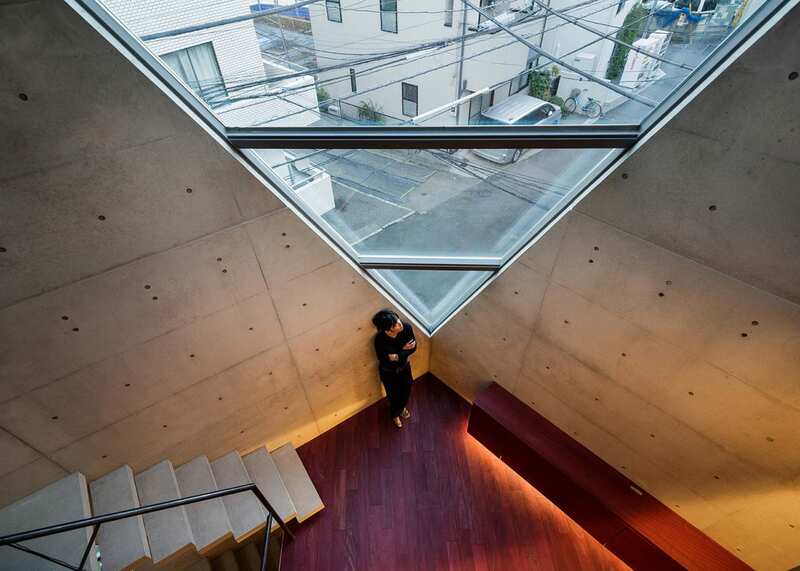 Sliced architecture is an ode to skylights, primarily, but not just your regular, run-of-the-mill skylights. Puh-lease! When has regular anything been the topic of discussion around here? Exactly! So, no, I’m not talking about the kind of skylight you chuck on top of a building in hope of allowing more natural light into an interior. No sir. 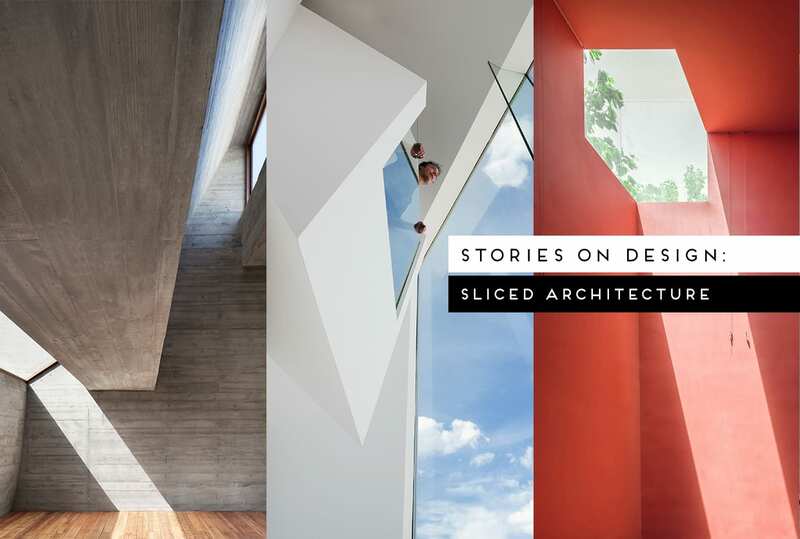 Sliced Architecture takes into account the entire architectural envelope, where the architects have made careful incisions into solid volumes with precision, not unlike that of a surgeon. Specific, accurate, measured and quite deliberate. 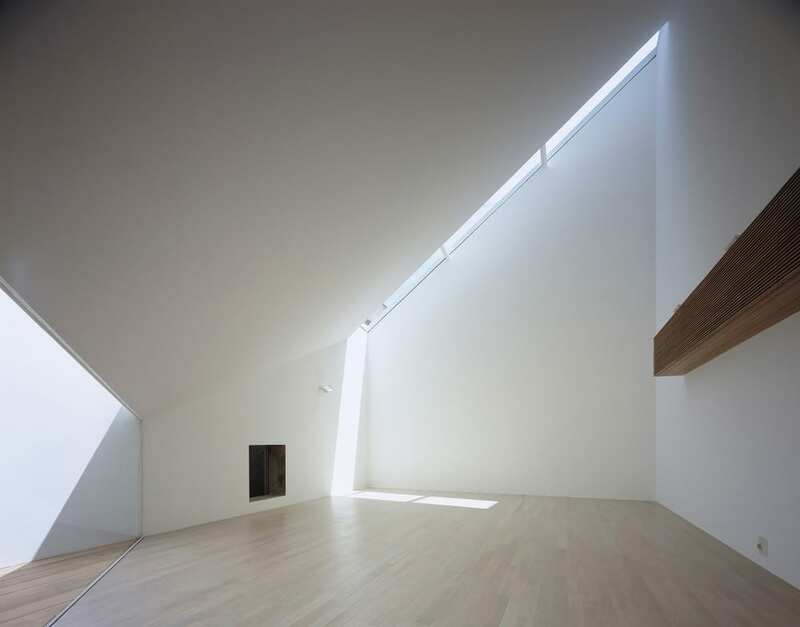 Today we examine houses (and a handful of other building types such as churches and commercial spaces) which employ skylights to an extraordinary effect. 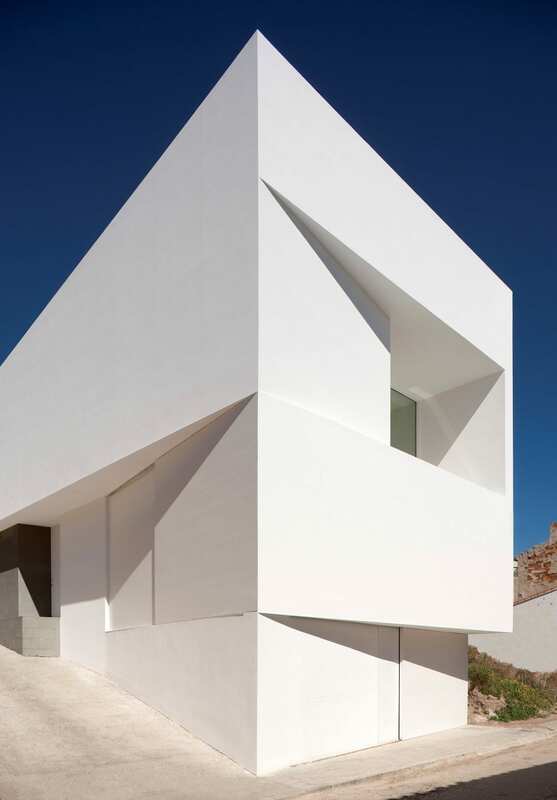 These precise cuts into the architectural envelope are often coupled with vertical and angular slices that create truly three-dimensional openings towards the sky. 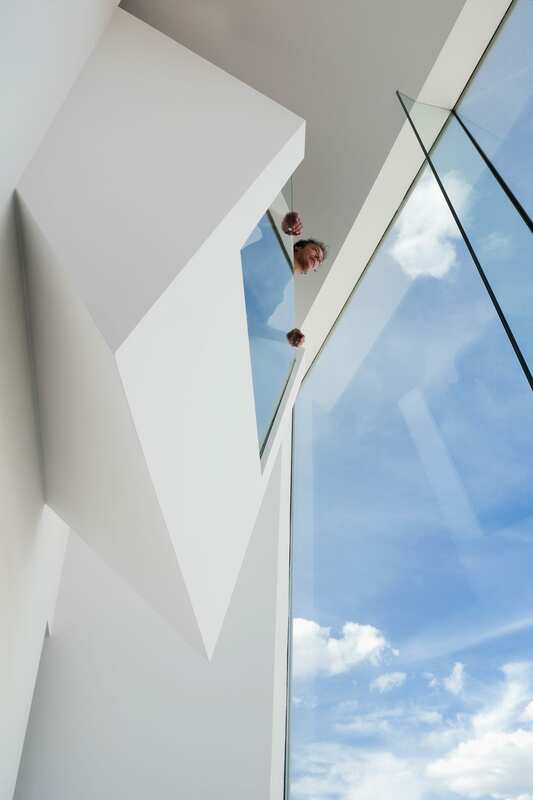 So yes, not just skylights but also vertical glass panels, clearstory windows, angular and corner cutaways. 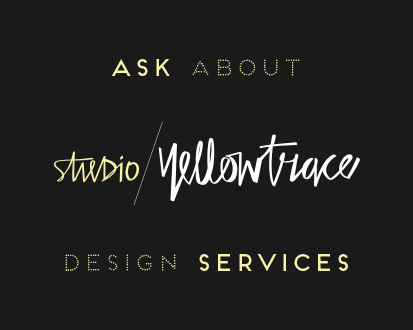 All in the name of celebrating the beauty of natural light, creating interior spaces that come alive, awash with light and shadows, designed for human comfort and cumulative experience. The stuff true architectural poetry is made of. 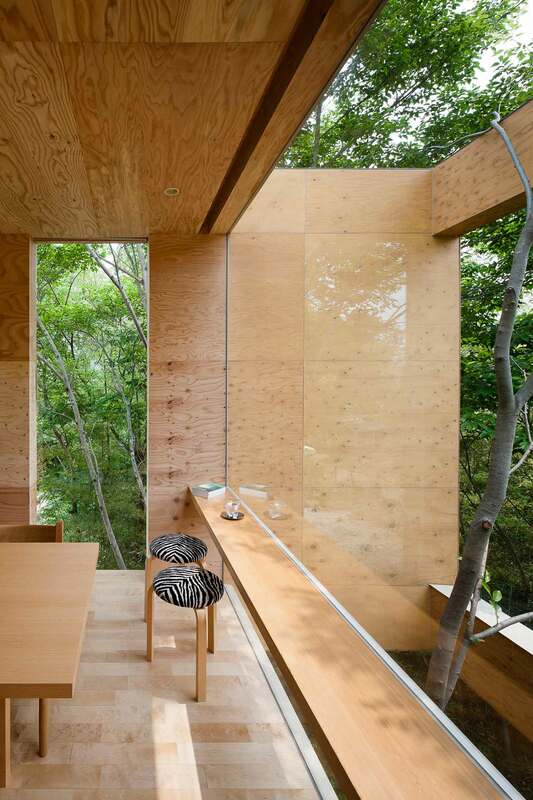 +node in Hiroshima, Japan by UID Architects // This cantilevered timber house by Japanese studio UID Architects hovers 10 meters above the forest floor, with a space beneath that allows trees to grow up inside. Abundance of vertical and horizontal incisions within walls and ceilings brings the surrounding woodland to its inhabitants. 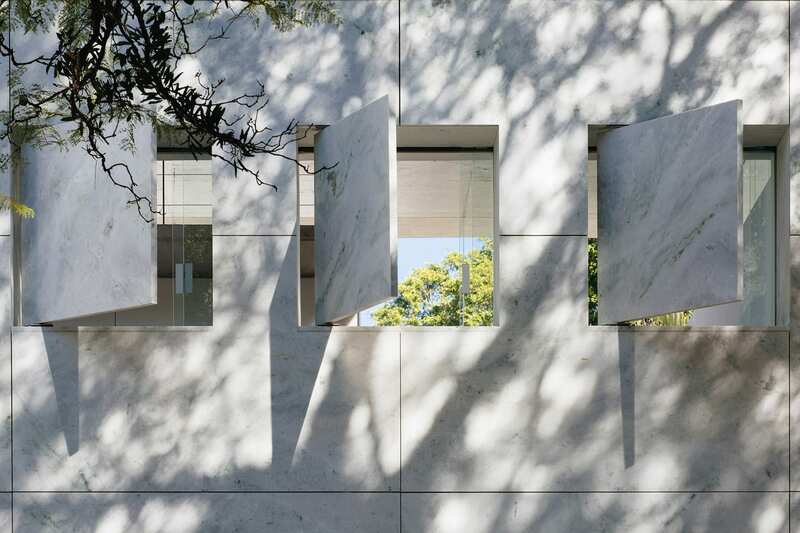 Jac house in Sydney’s inner west by panovscott // panovscott’s clients wanted a house that would allow them a proximate connection to the environment. The one that enabled an experience of their garden and the street, as well as the passing of the seasons and the time of day, to become an intrinsic part of their daily experience. 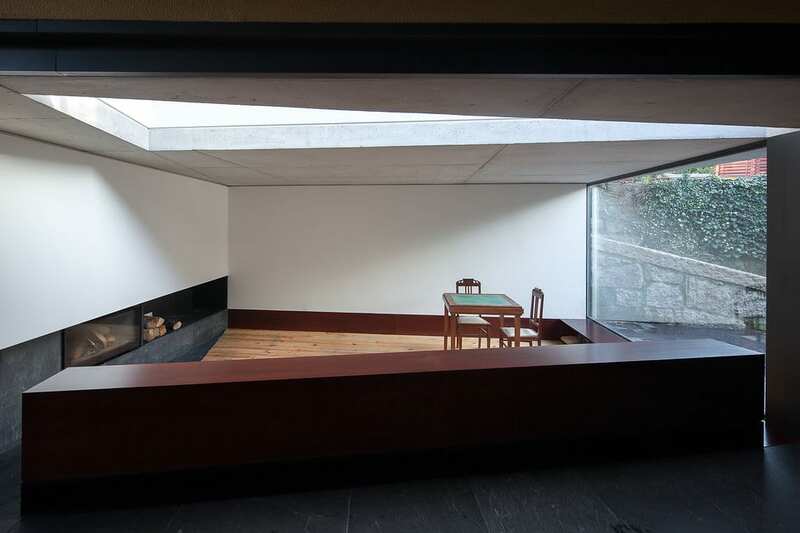 The resulting house is outward looking, finely attuned to the prevailing characteristics established by the site. Despite the generous size of the block, Jac house is relatively small, allowing the garden and the great Jacaranda to hold court. The windows that allow constant interactions with the context are huge in scale. 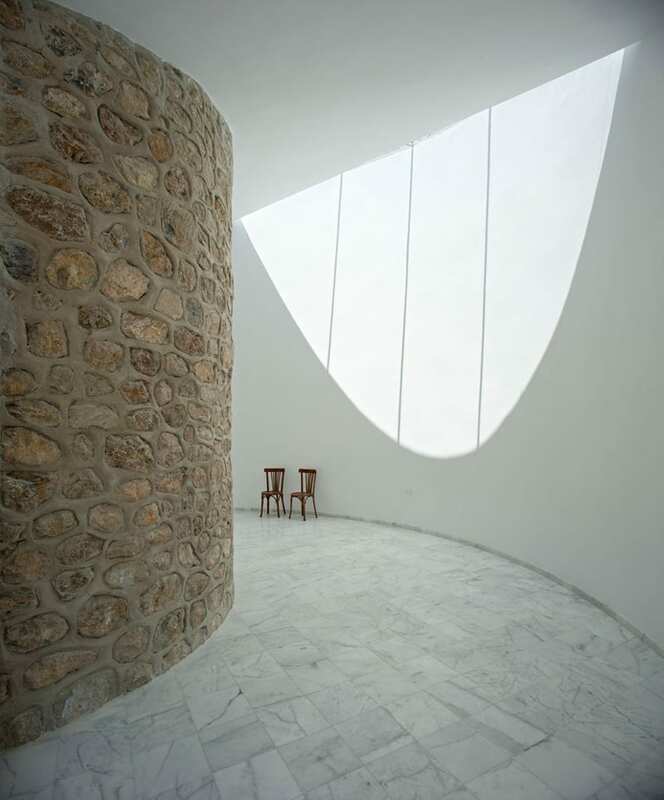 In the great room, the space rises vertically via a void in the level above, expanding to the sky, but then also horizontally, allowing the experience of the full width of the land. 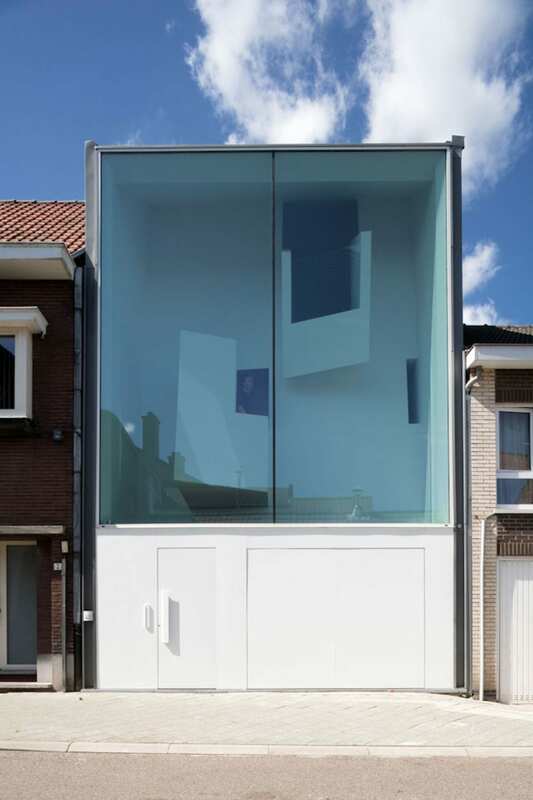 Image courtesy of Skylab Architecture. Hoke Residence in Portland, USA by Skylab Architecture // Conceived as an elegant and playful intersection of inside-out spaces, the Hoke Residence is an interplay between the vibrant outdoor environment and dramatic interior with its deftly angular details that provide framed views of the forest canopy. At once urban and wild, the residence sits in harmony with its location at the border of Portland and Forest Park. 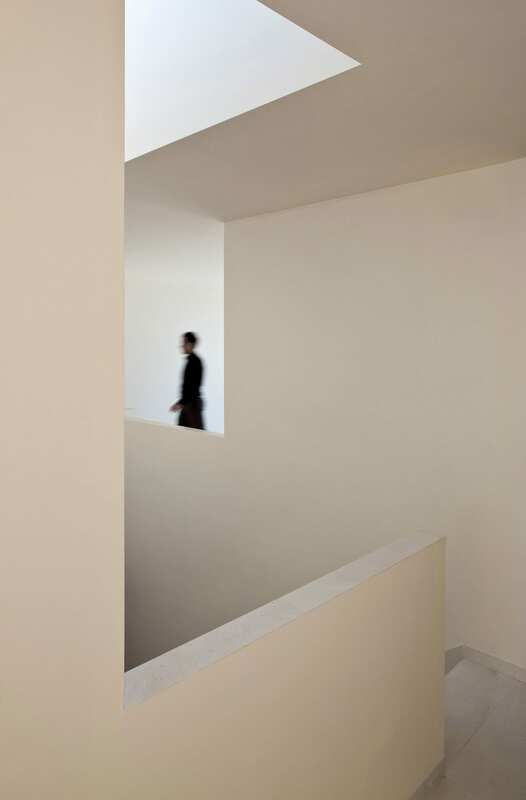 Image courtesy of l’escaut architectures. 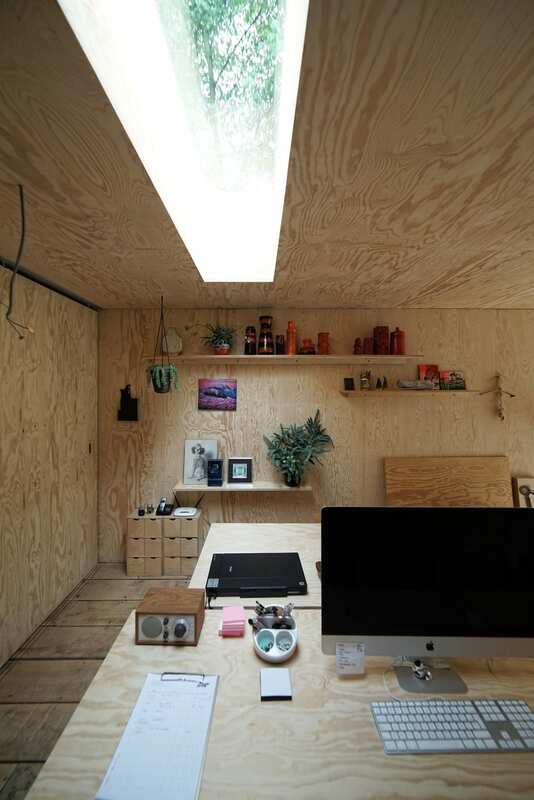 Atelier Pam & Jenny by l’escaut architectures // Completed in 2008, two thirds of this workshop for a graphic designer lies beneath the ground level, reminiscent of a ‘Hobbit’ house. 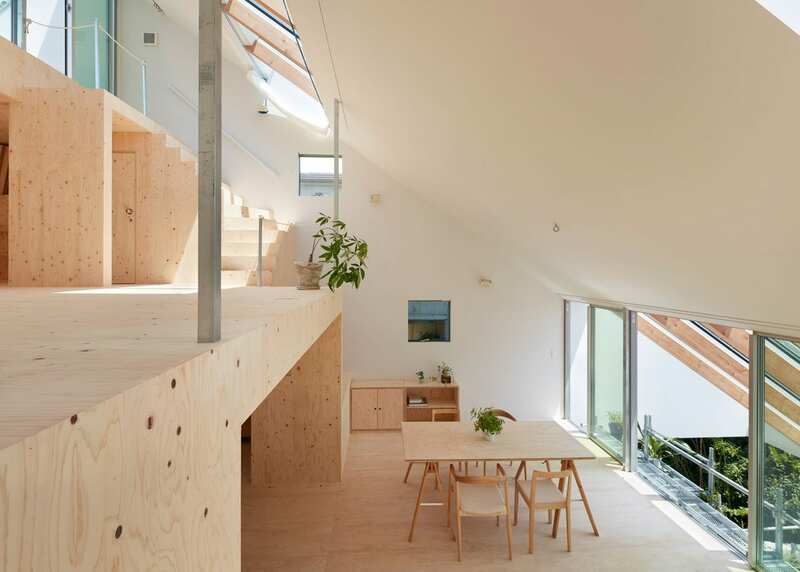 The roof plane contains a hidden plywood-lined cut out that allows the light and spectacular views of the treetops above. 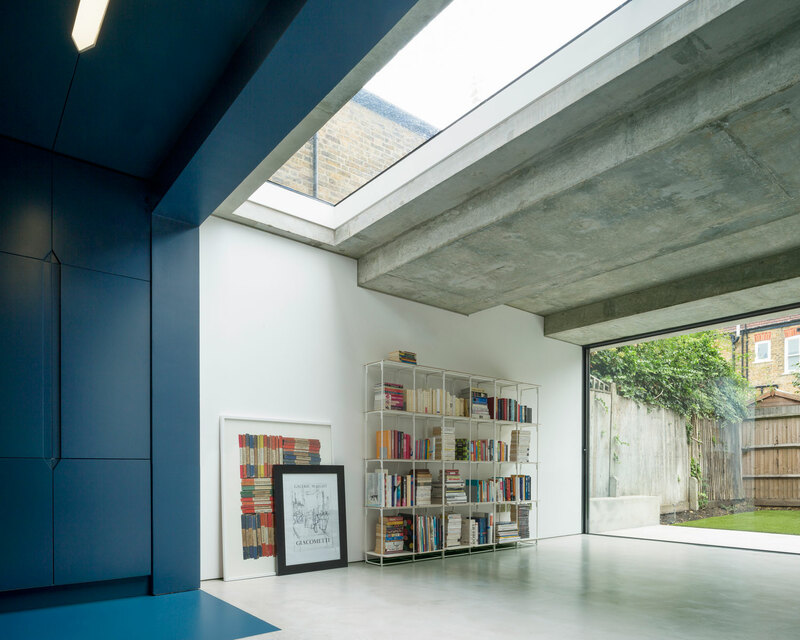 Image courtesy of Adam Richards Architects. 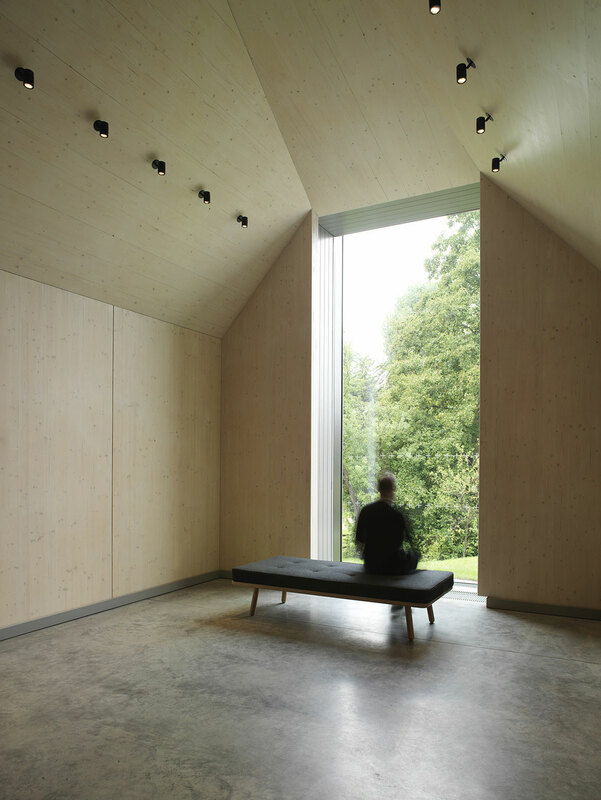 Ditchling Museum of Art & Craft by Adam Richards Architects // Located in the Ditchling village, Adam Richards Architects have designed and renovated a series of new and existing buildings and spaces that enter into a critical dialogue with the village and its history, the museum and its collection. The culmination of the museum is a gallery that houses the Stanhope Press, which is placed at the end of a bright, chapel-like space. New windows in this gallery give a final view from the press to the South Downs, invoking the unity of landscape, craft & ritual that so inspired the artists who came to Ditchling. 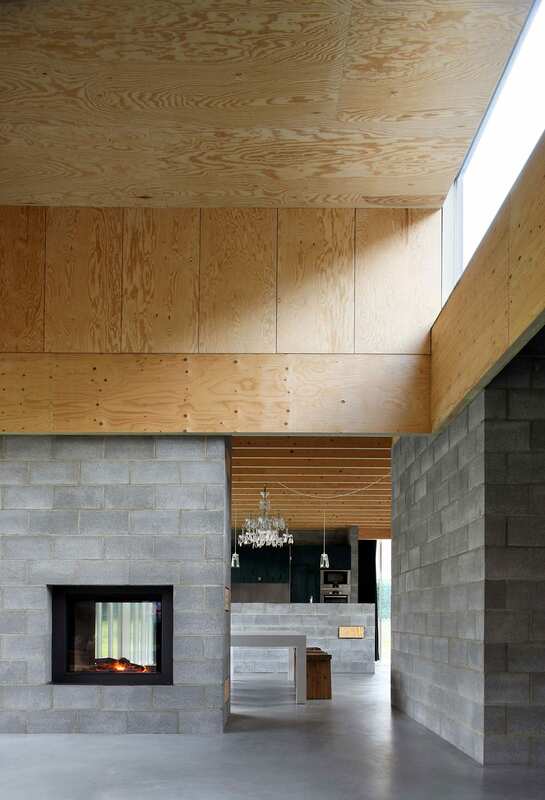 Waasmunster House in Belgium by ONO architectuur // Located in the edges of a pine forest, ONO architectuur have utilised simple construction for this house designed on a limited budget. 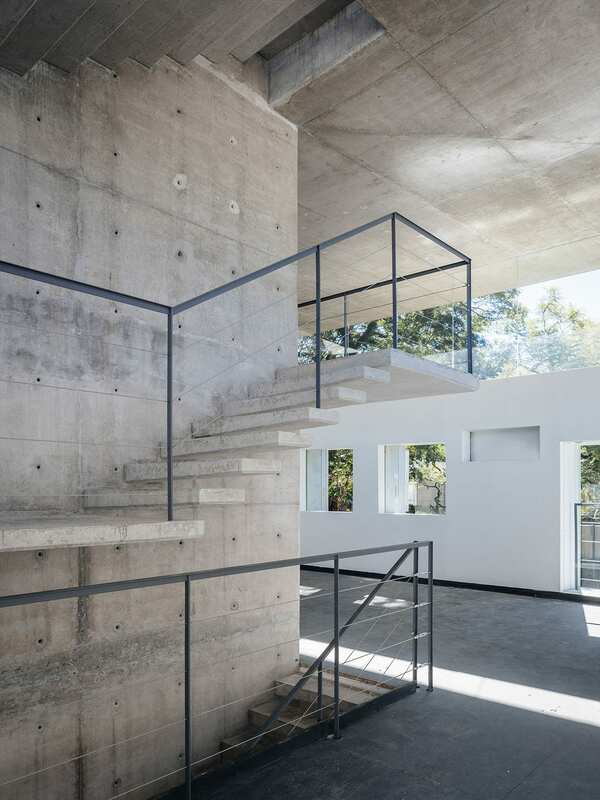 Capturing the pure essence of the materials, the house is created as a composition of commonplace components: concrete slabs, masonry blocks, timber roof, simple greenhouse glazing, drains designed as spouts, prefab concrete wall cladding, etc. However, it is in their composition that these banal components become interesting. Generous clearstory windows direct the views upwards towards the sky and surrounding pine tree canopies. 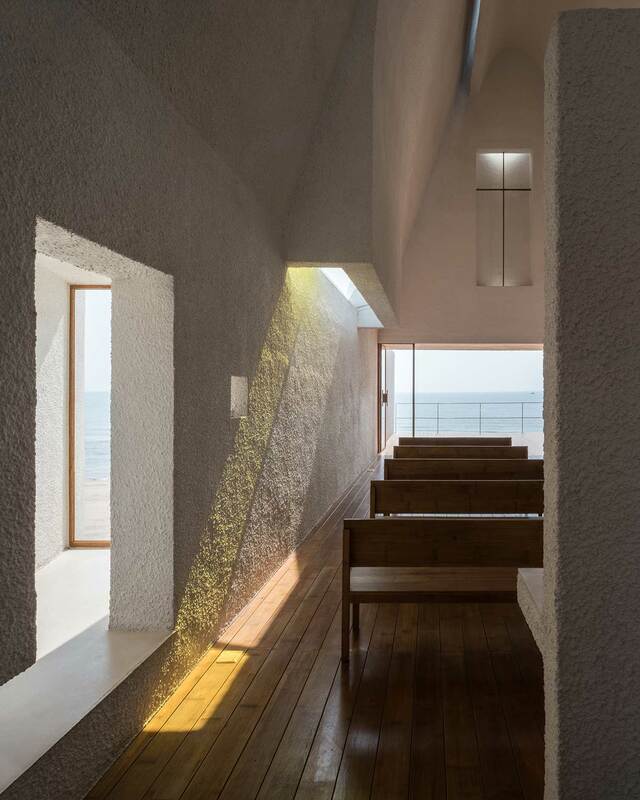 Seashore Library in China by Vector Architects // From outside, it looks like a weathered rock that is pure and solid; but inside, it contains rich feelings and experiences. 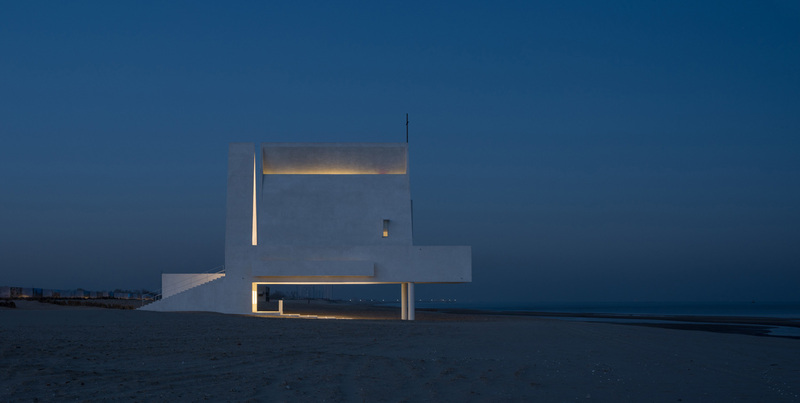 This cast-concrete library sits on a stretch of deserted beach facing the East China Sea topped by a curving ceiling. 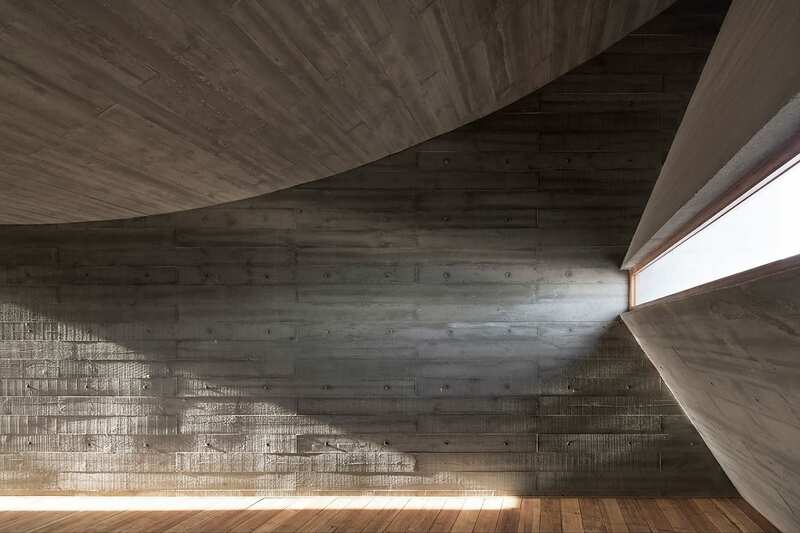 The cast in-situ concrete walls are imprinted with the grain of their timber formwork – influenced by the rippled markings left behind on the sand by the wind and water. 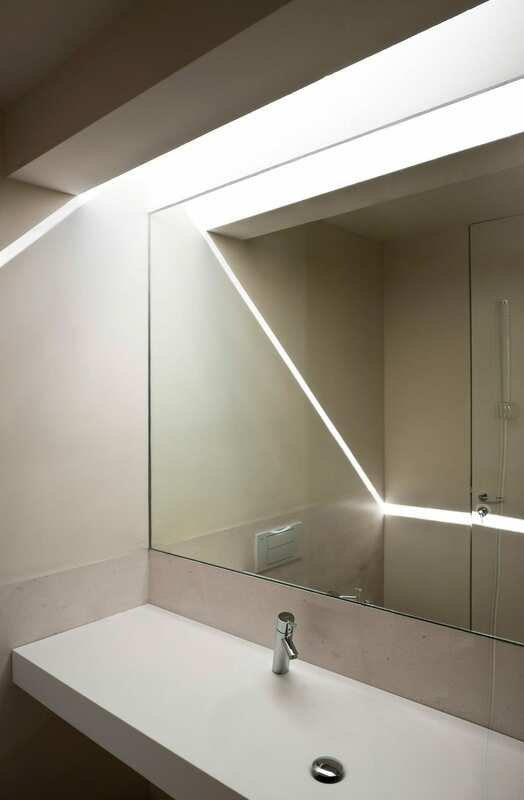 Cunning slices in walls and ceilings highlight the wall textures, and animate the interior with light beams and cast shadows. 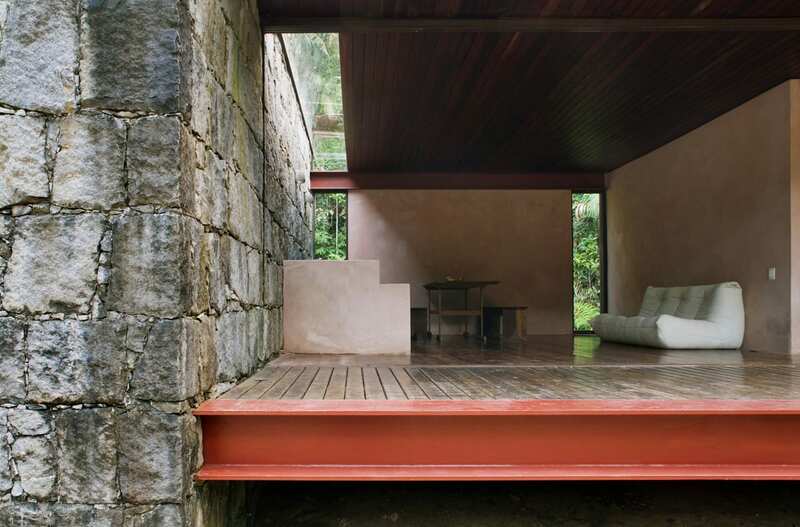 Rio Bonito House in Brazil by Carla Juaçaba // This residence slash retreat sits within a nature preserve, situated in the Nova Friburgo mountains of the Rio Bonito hinterland. 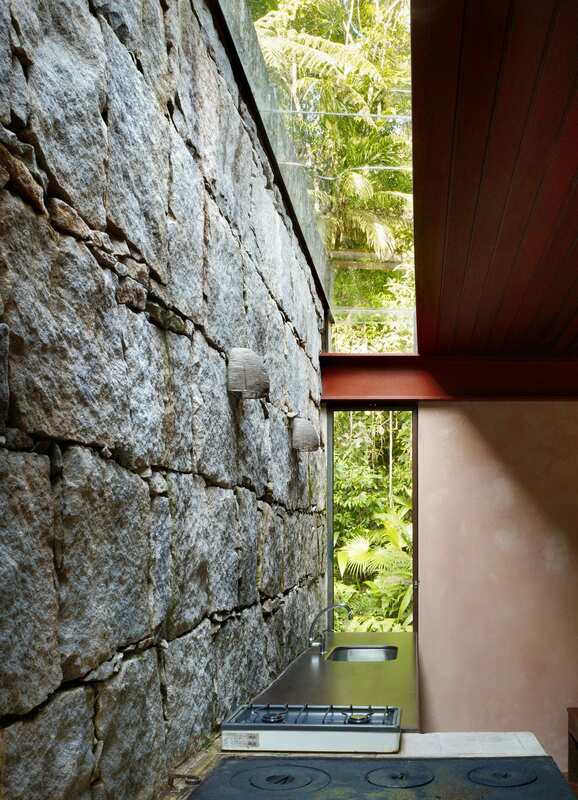 Two 1.1m thick stone walls support the four steel beams, upon which the floor and roof structure rest. 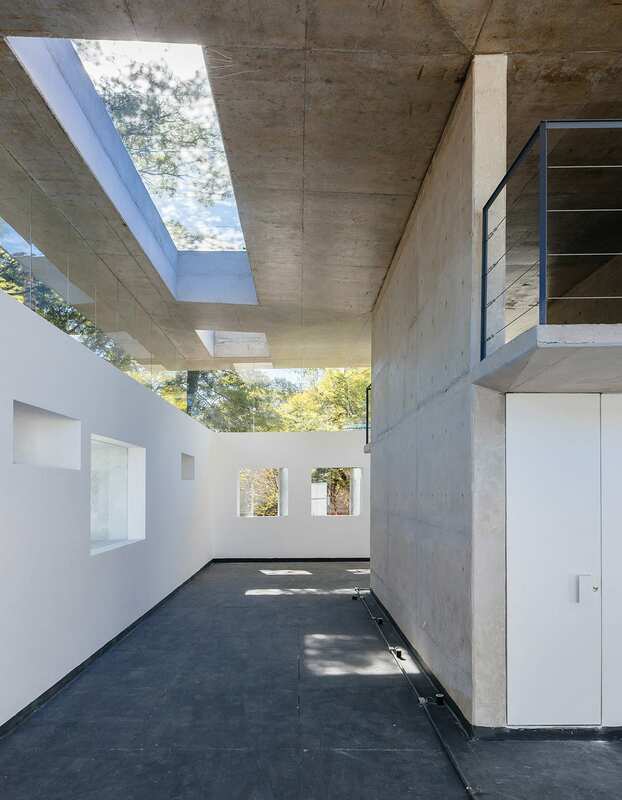 The weight of the structure sits in contrast with the lightness of the interior volume, which is enhanced by two skylights that separate the upper story from the structural walls. 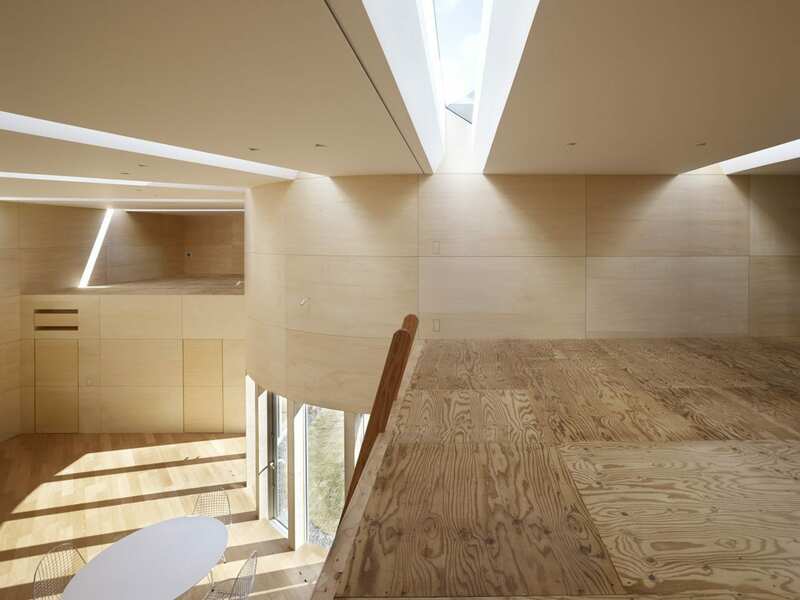 On the back wall, the windows extend from floor to ceiling, providing vertical continuity for the horizontally placed skylights. So much YES right there! Balnarring Retreat by Branch Studio Architects // Balnarring Retreat is a purposefully Lo-Fi cabin that doesn’t require of you to sit and meditate in order to slow down and stop the rushing speed of the world. 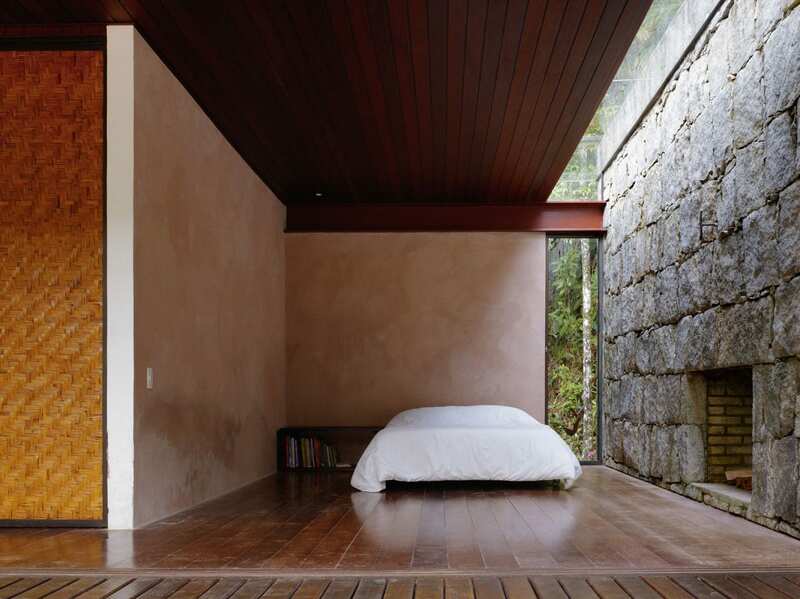 “The retreat embraces a low-tech aesthetic towards the operation of the building itself, fully embodying the idea of retreat and slowing down. 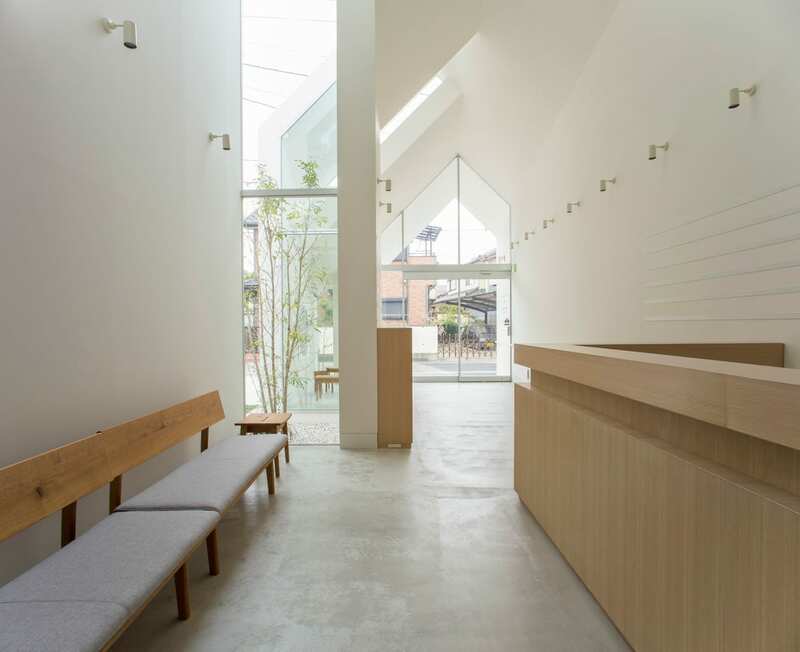 Celebrating craftsmanship and integrity of materiality instead of technology,” said the architects. 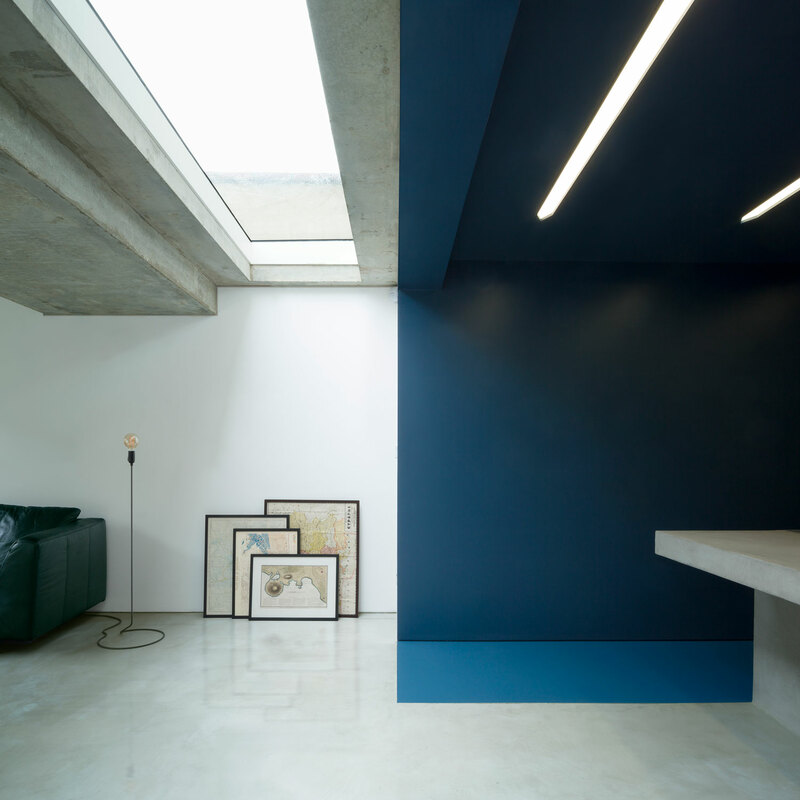 The context of the site was an important aspect of the project. “The connection with place, in this case nature, is an important element… the relentless croak of the frogs, the mesmerising water reflections that dance on the ceiling, the ducks and other water birds paddling past and the dense greenery swaying in the breeze,” they said. 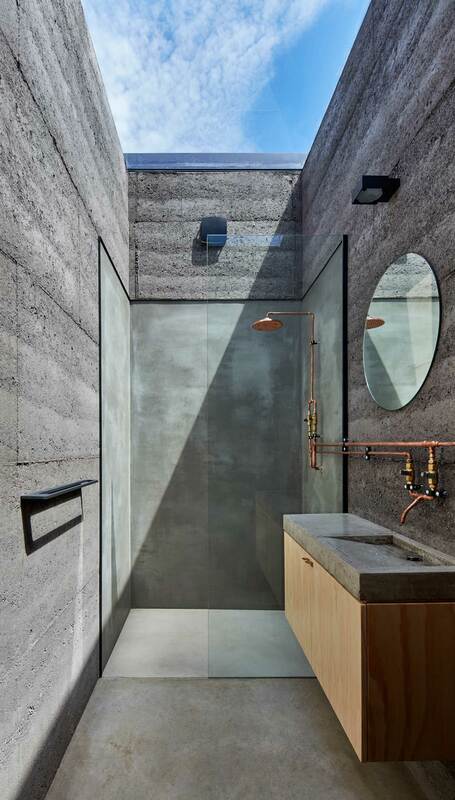 In addition to embracing the breath-taking view of the lake it sits over, connection to nature is also addressed within the cabin’s shower cubicle. Perfect for blue sky thinking, no? 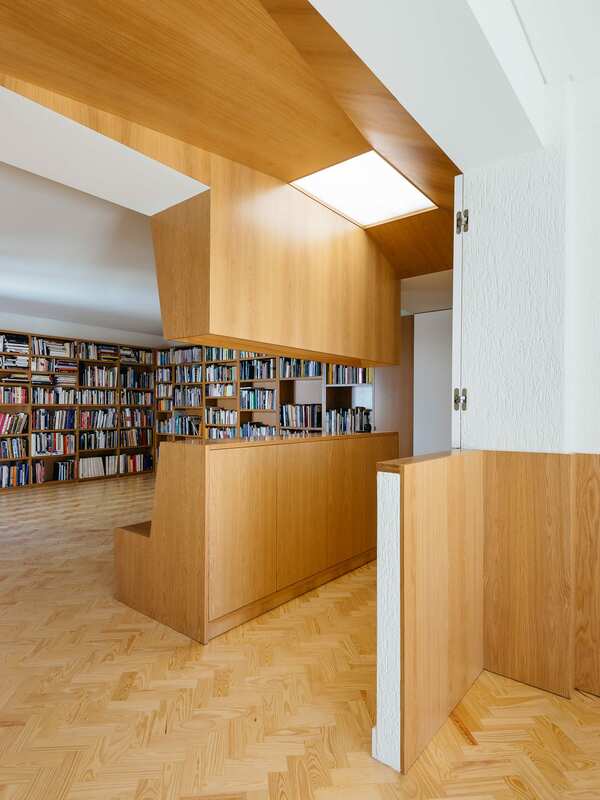 CJ5 House in Vienna, Austria by Caramel Architekten // This house in Vienna has a long and narrow floorplan that measures 5 x 35 meters. 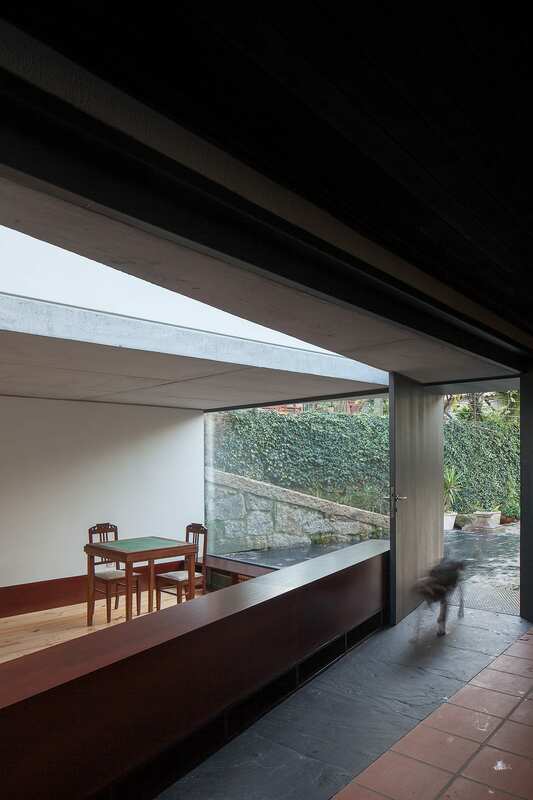 An internal connection between the living levels and a central atrium garden is achieved via the means of large glazed cut-outs that open up vertically from the living area. 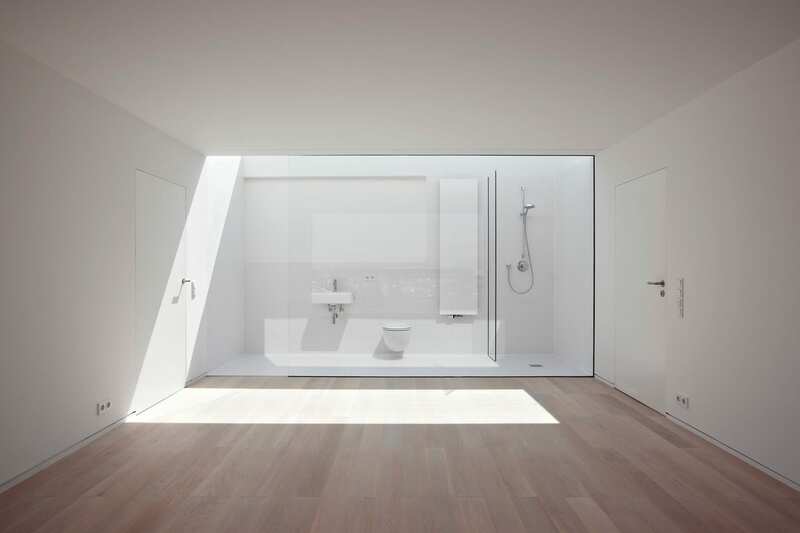 An internal set of very spacious interlocking rooms is developed, despite the narrowness of the property. 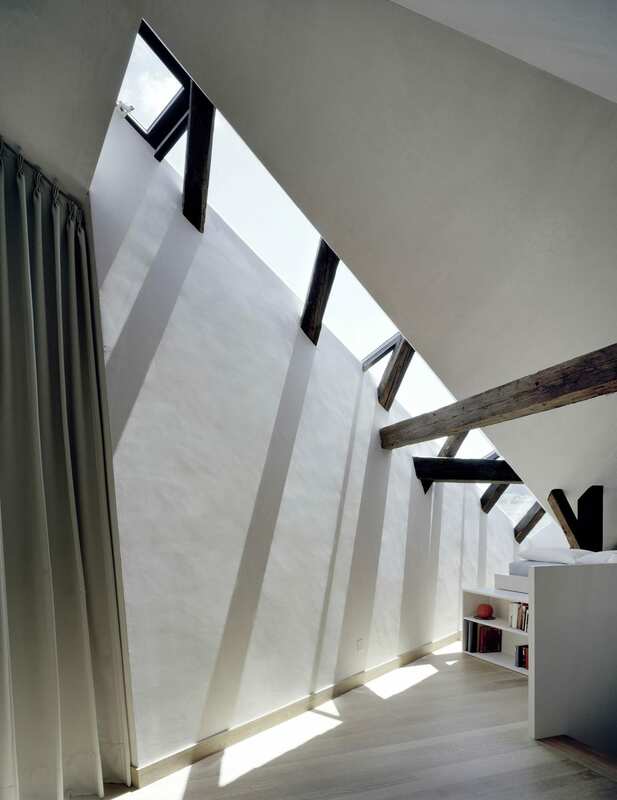 Loft Conversion in Burgdorf, Switzerland by Freiluft // Through a slanted cut in the roof, light flows down the wall and into the once windowless attic, with the old timber roof truss celebrated in all its glory. Delicious. Photography by Javier Callejas Sevilla. 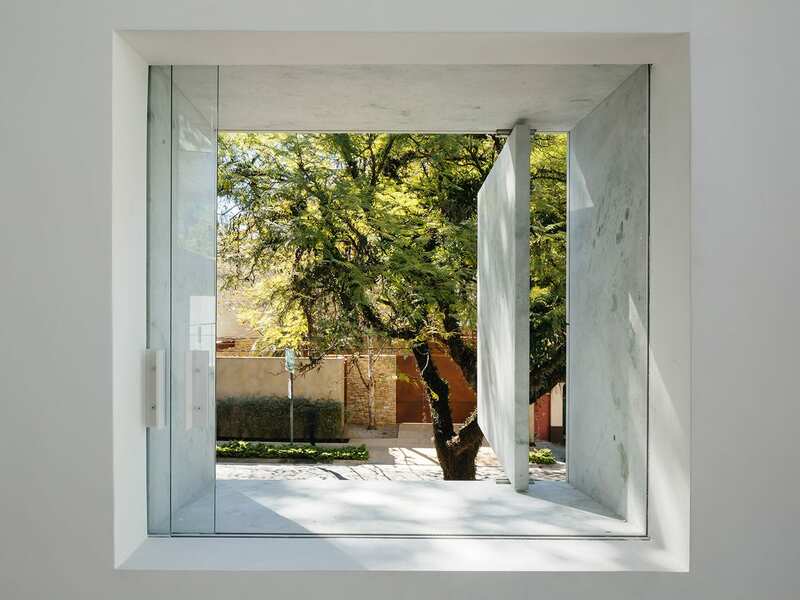 Funeral Parlour in Murtas, Spain by Muñoz Miranda Architects // Two concave rooms, one public and one more private are united by the light, acting “as an ontological reflection of each space”. 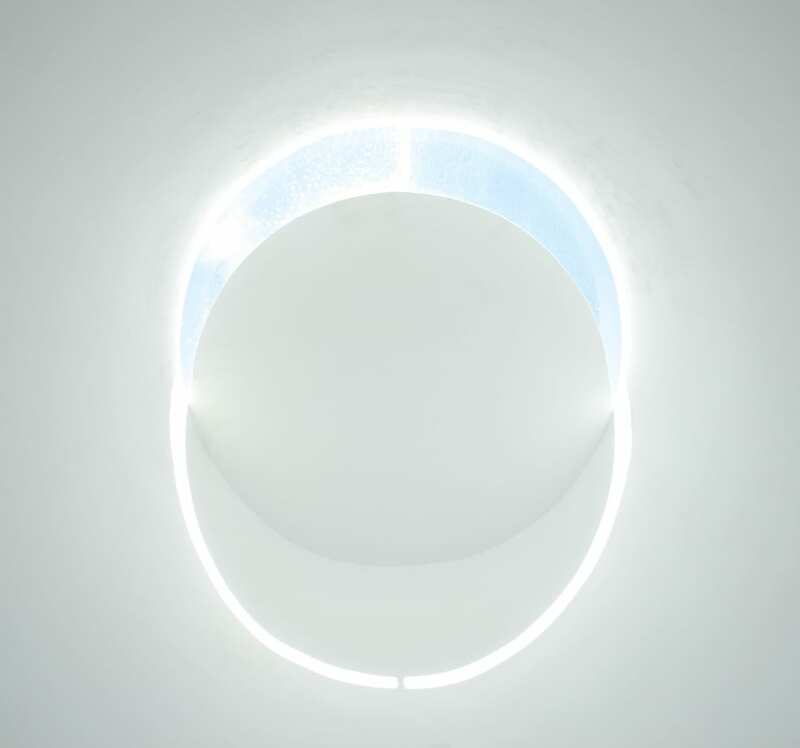 The midday sun forms an eclipse as continuous ring drawn together by direct and projected light, where land (material light projected onto the curved wall) and sky (immaterial direct light) engage in one particular moment of magic, releasing “the soul in its ascent to heaven”. Divine. 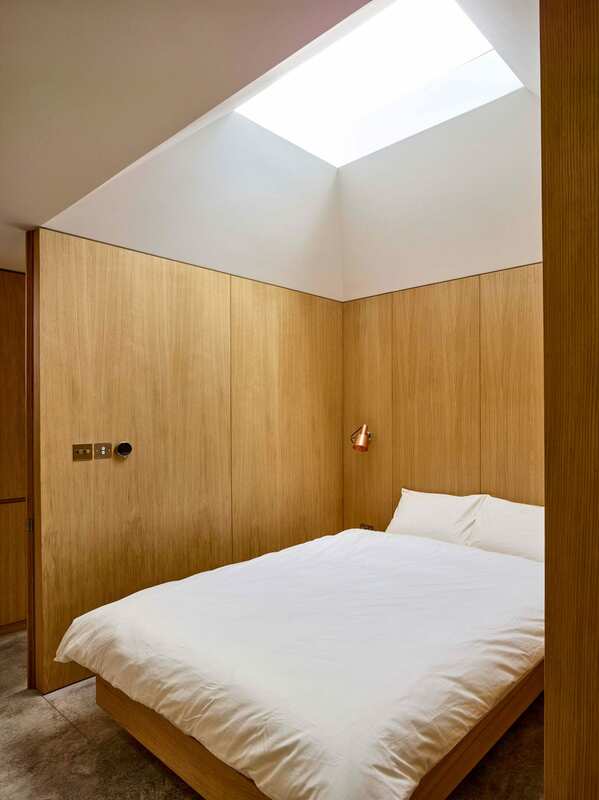 Hidden House in Clerkenwell, London by Coffey Architect // Located in a Grade II heritage listed building in Clerkenwell Green Conservation Area, the interior of this home is defined as a perimeter wall of oak panelling, upon which sits a floating transparent punched roof, delineating living spaces below, bathed in light. 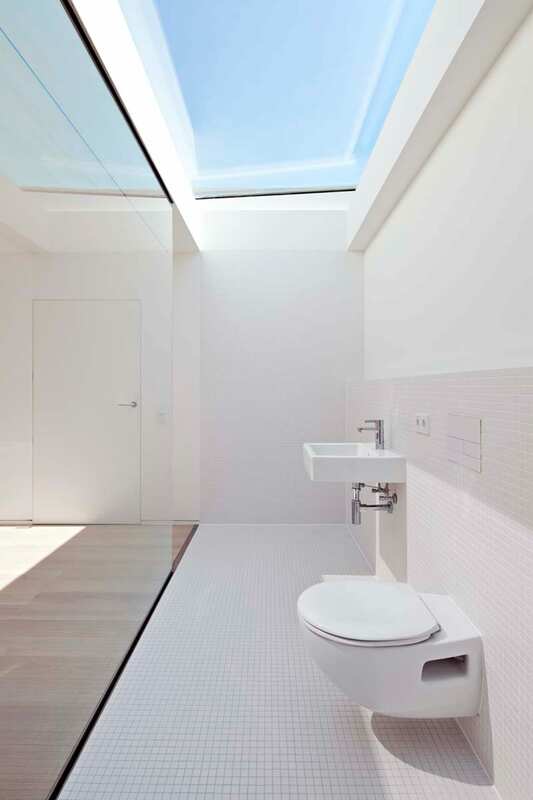 Ocular rooflights allow views to the sky and to the heavy decoration of the adjacent elevation of the former school building. 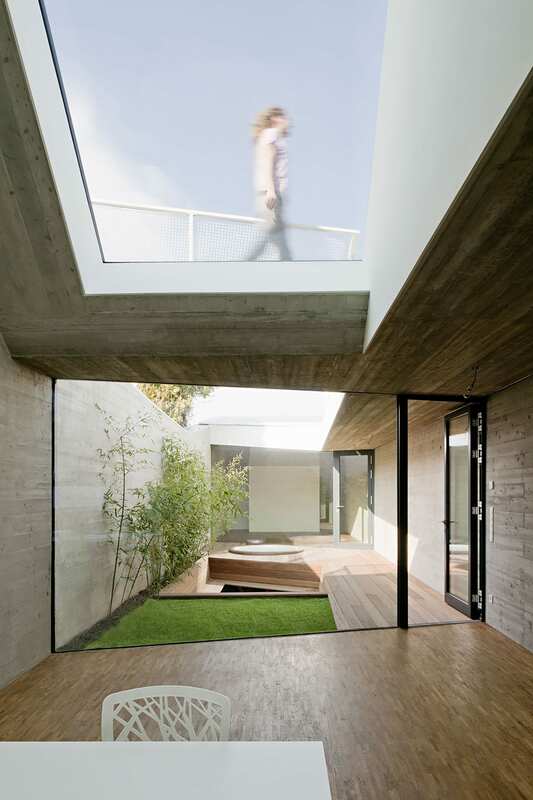 Images courtesy of Aurora Arquitectos. 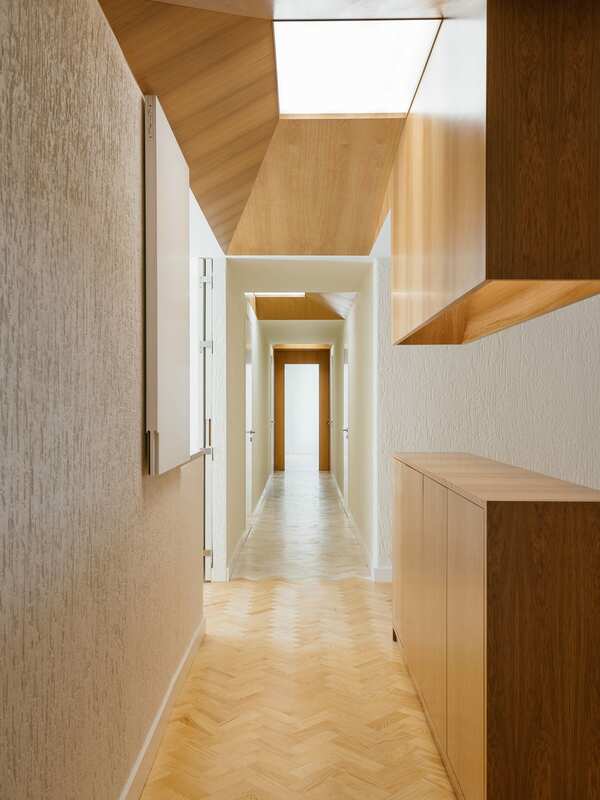 Apartment at Luciano Cordeiro in Lisbon, Portugal by Aurora Arquitectos // The corridor design is a stand out in this interior with it punctuated ceiling light-wells that dissect the axis of the long space at the doorway junctions. 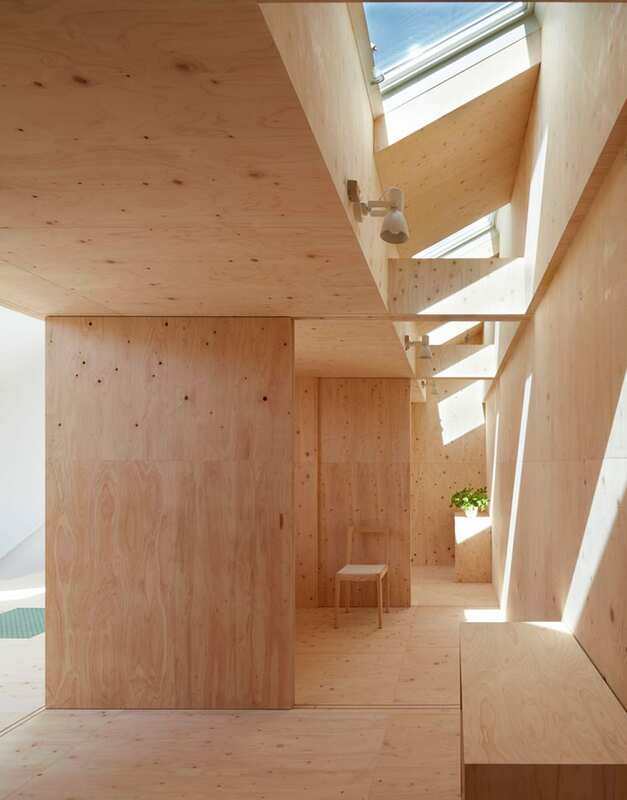 These oh-so-simple light-wells present as beautifully articulated timber panels that are gently angled towards the roofline, like finely crafted geometric boxes with milky white panels pouring light into the corridor below. 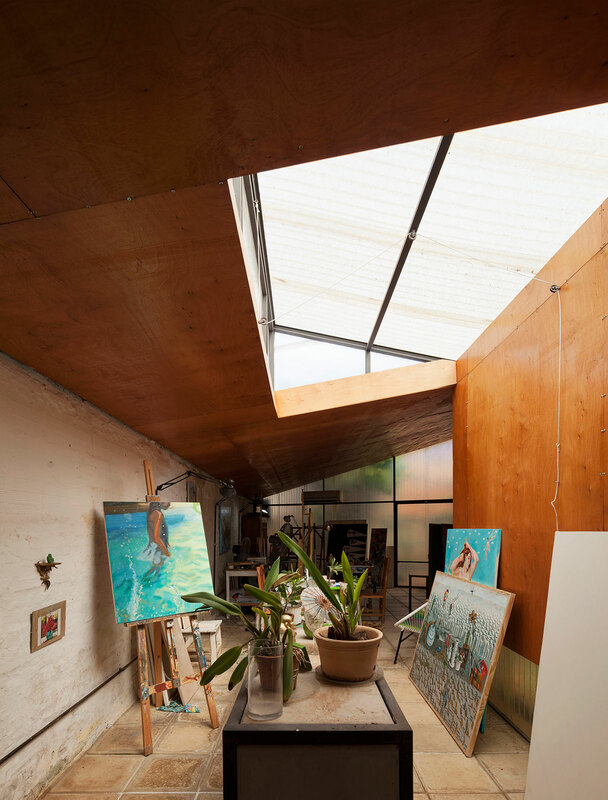 Álvarez-Nuovo Atelier in Paraguay by Nicolás Berger & Giacomo Favilli // The angular roof section carved overhead this painting studio lets in tones of natural light. 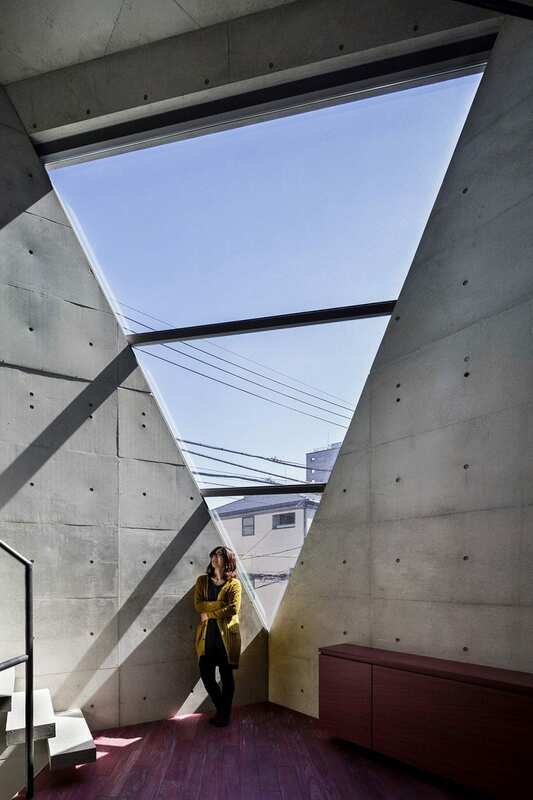 “The angled light serves as a material to the artists,” said the architects. 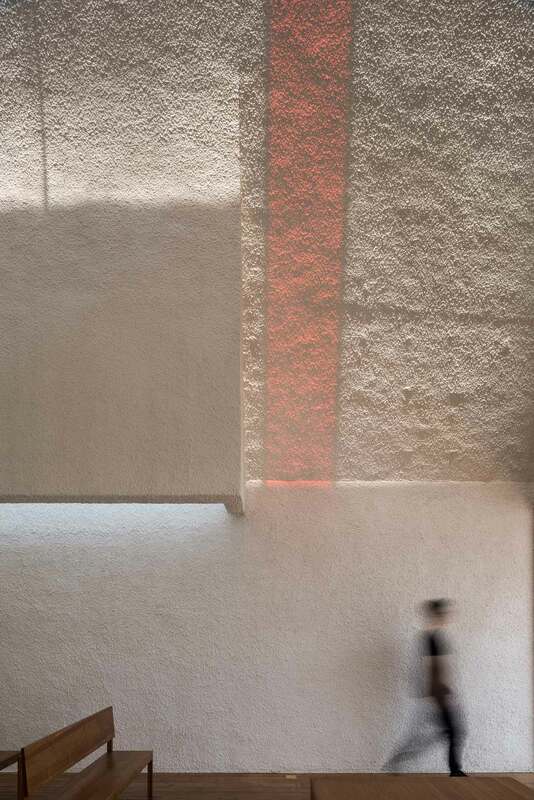 The space, with its earthy red/orange timber walls feels both cocooned from the outside world but also illuminated at the same time, by the bright sunlight streaming in from the geometric cut-out in the roof. Holiday House in Cap Ferret by Atelier du Pont // Within this holiday cabin in France, a series of large triangular openings sitting on a diagonal plane frame the views of the surrounding nature. Yeah… You had me at ‘Holiday cabin in France’. 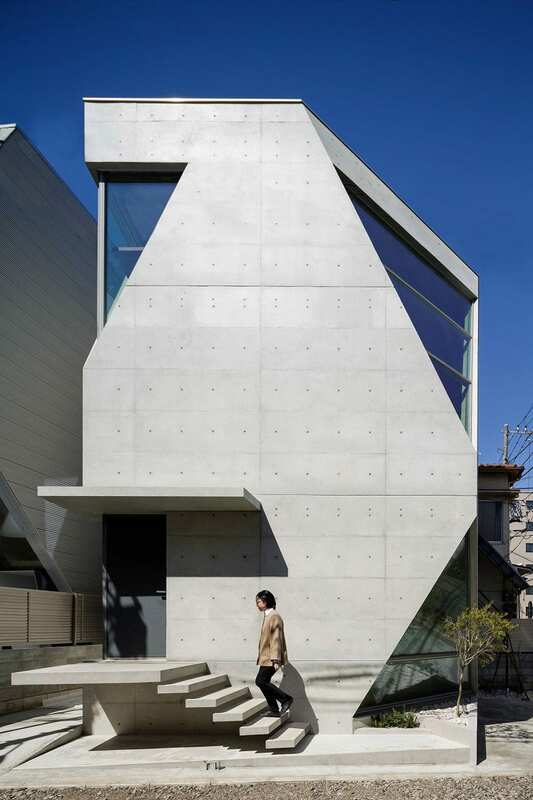 A Hill On A House in Tokyo, Japan by Yuko Nagayama & Associates // This urban house is surrounded by tall buildings on all sides except for the northeast facing a street. 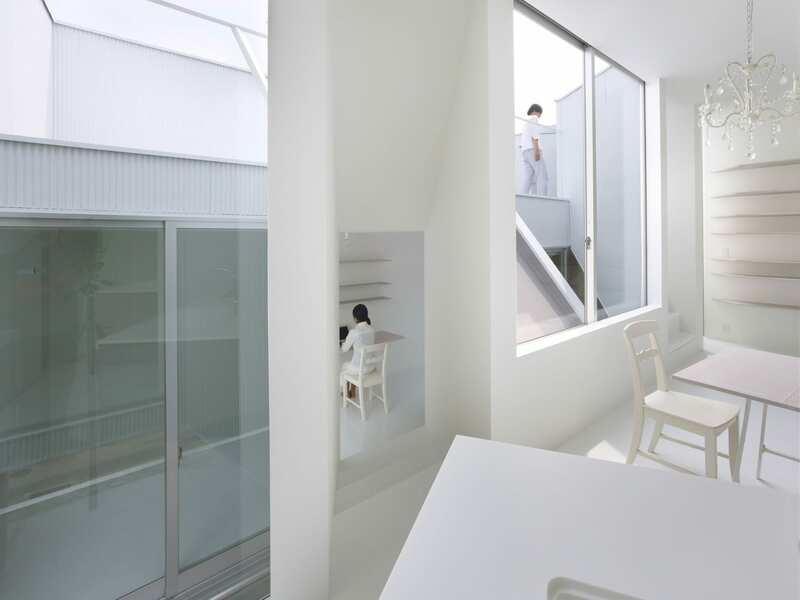 The issue was how to bring light into the interior, to open the enclosed volume and to develop scenery within it while maintaining privacy from the neighbours. 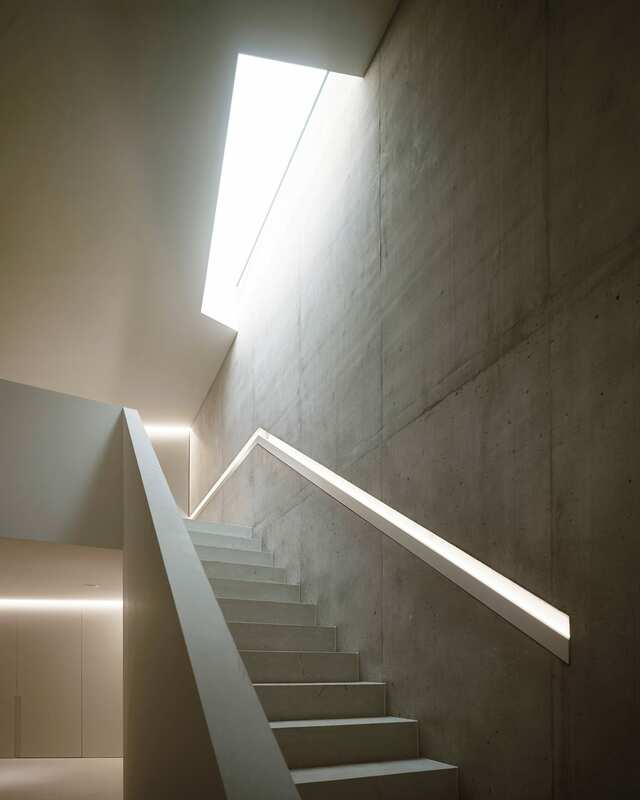 There rises a white illuminated ‘hill’ in the house. 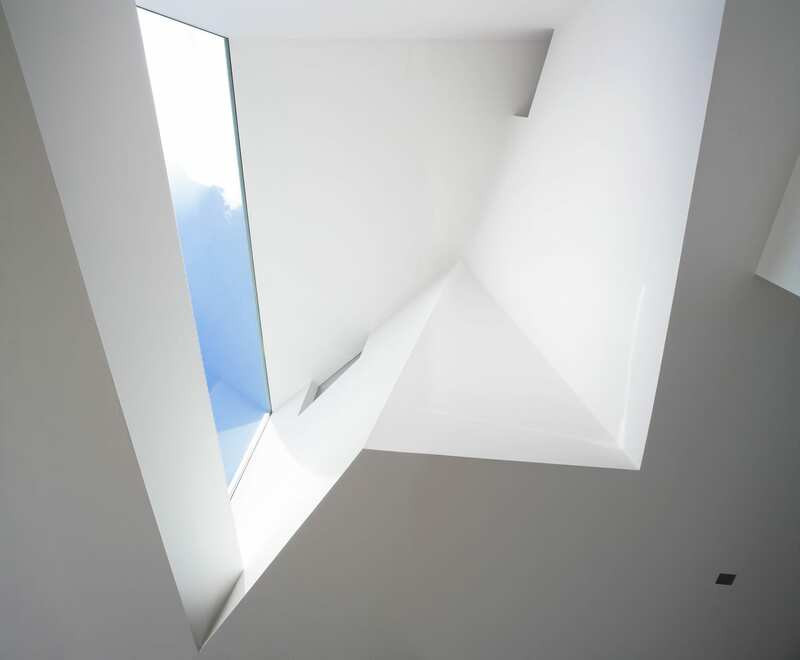 Its slope tilting to the southwest receives and reflects sun light onto the interior. 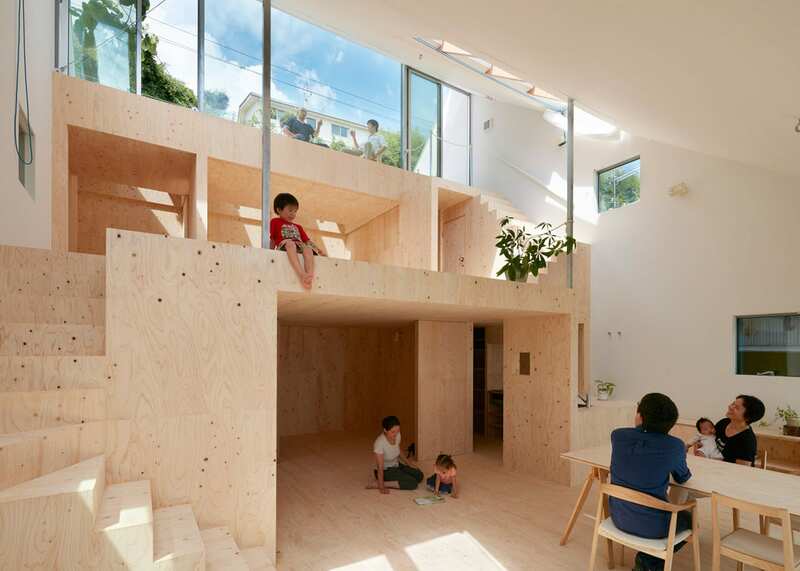 “The ‘hill’ that can be seen from all the rooms but never be reached by anyone, is a place shared in our consciousness belonging to nobody,” said the architects. 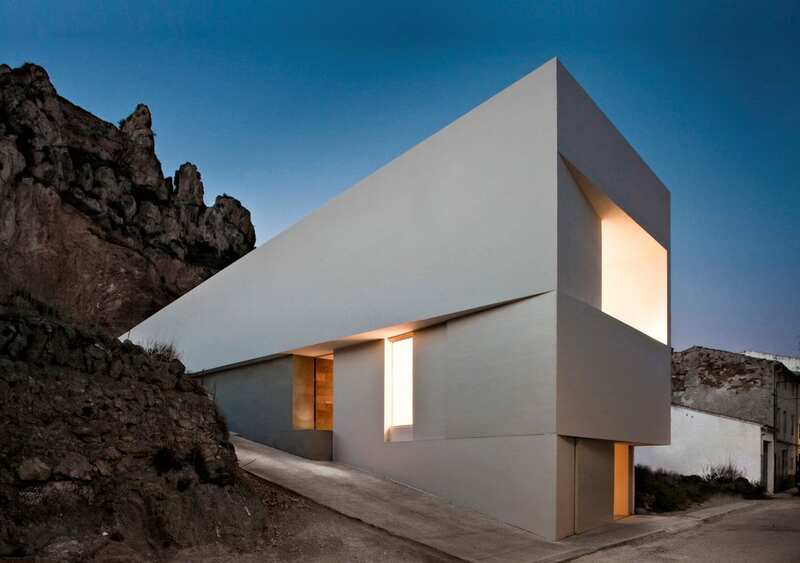 House on the Castle Mountainside in Ayora, Spain by Fran Silvestre Arquitectos // Located within a landscape of unique beauty, this house is designed as a crisp white box with minimal vertical openings. 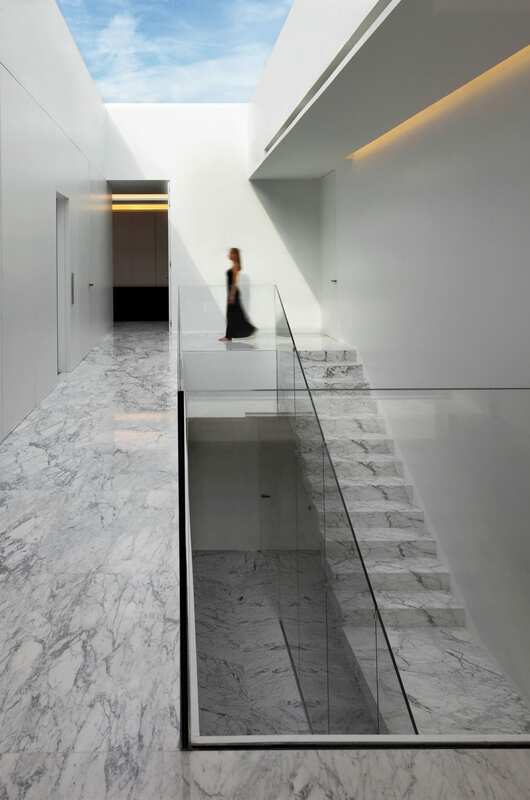 The indoor space is divided by the void above which sits a large skylight that acts as the main illumination source for the core of the house. 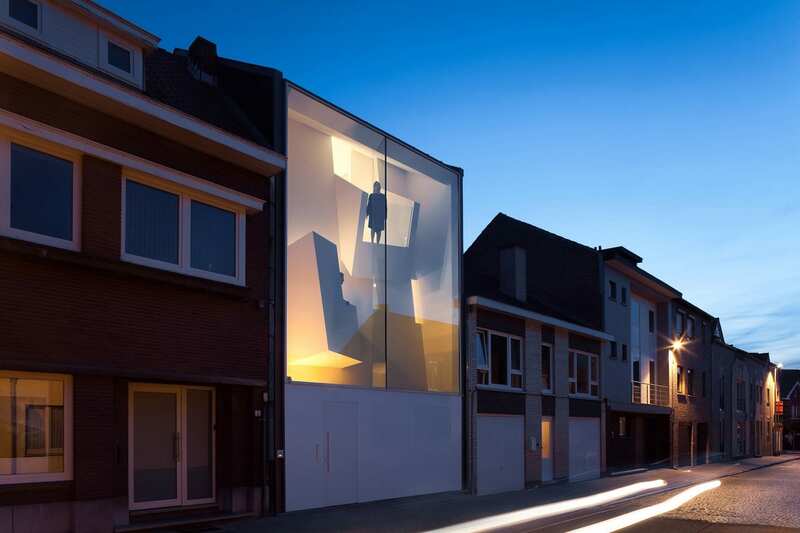 The Narrow House in Bilzen, Belgium by Bassam El Okeily // Designed in collaboration with Karla Menten, this contemporary three-storey residence presents to the street with a unique façade that screams for attention. 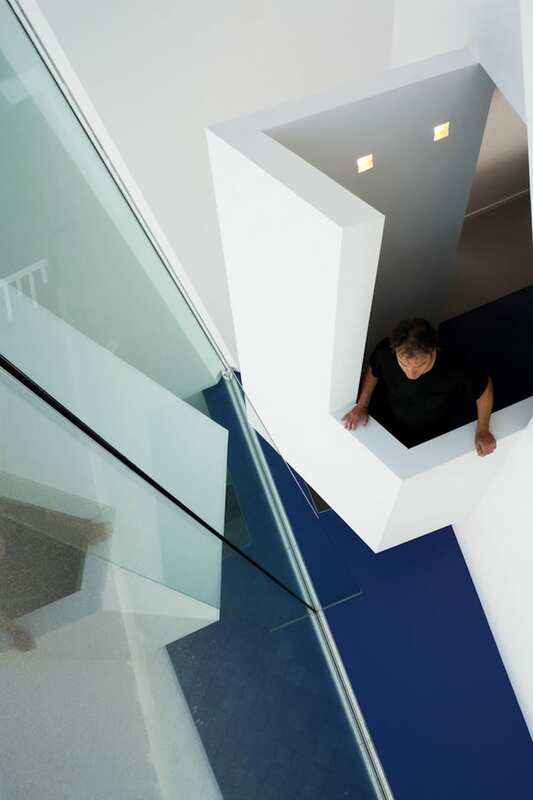 The contorted internal geometry that shapes interior spaces by slicing away ceiling mass and walls, is contained by a flat piece of glass, allowing the light to travel deep within the space. 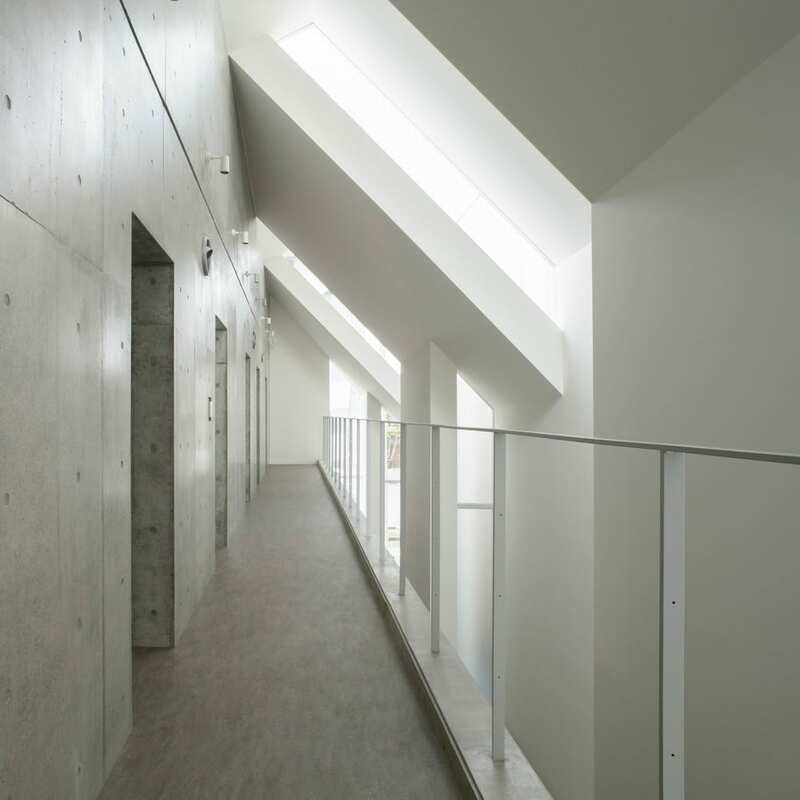 As the main living space on the second level is set back further into the lot, natural light enters from above. 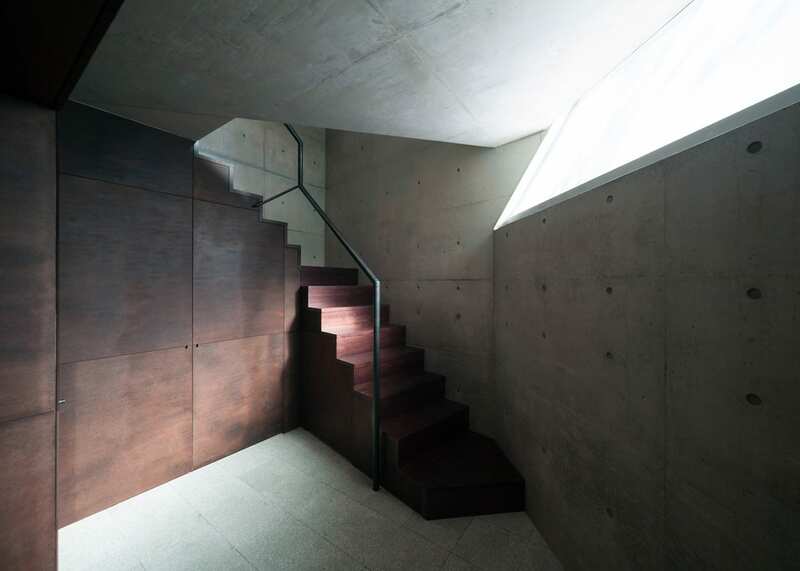 Small geometric windows and clerestories allow rooms that are not directly linked to the facade to still be bright and well-lit. 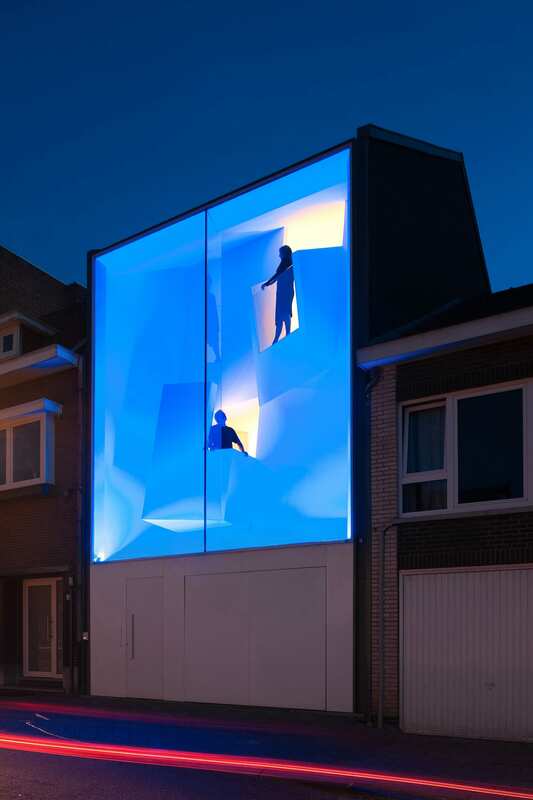 At night, the façade is lit in different colours allowing the house to act as “a public light sculpture”. 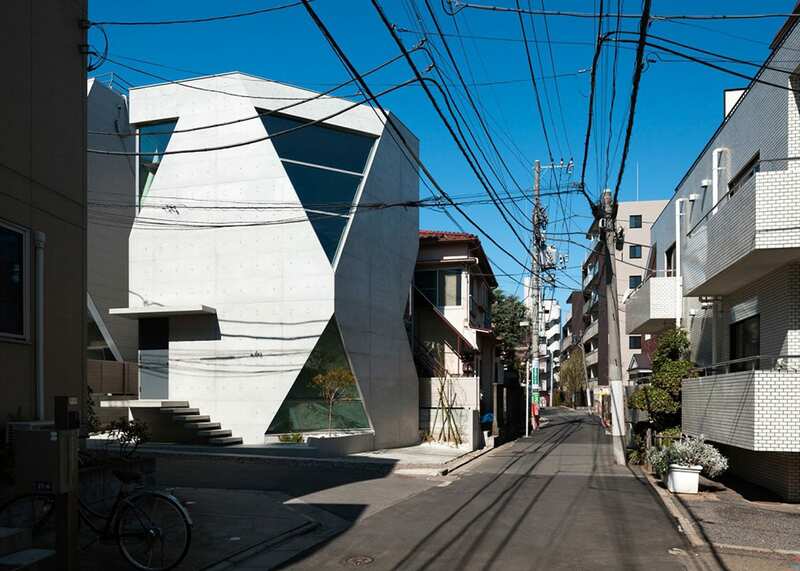 R-torso-C in Tokyo, Japan by Atelier Tekuto // Located on a corner site that measures a mere 66sqm , the architects made the most of the small footprint by building upwards. 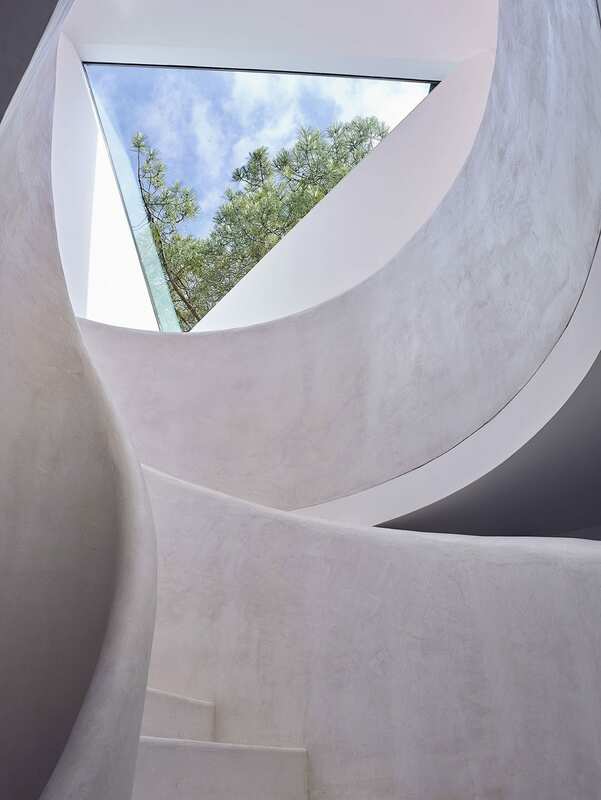 ”It’s the only direction with a true feeling of the vastness of nature – to form a strong connection with the sky” explain the architects. 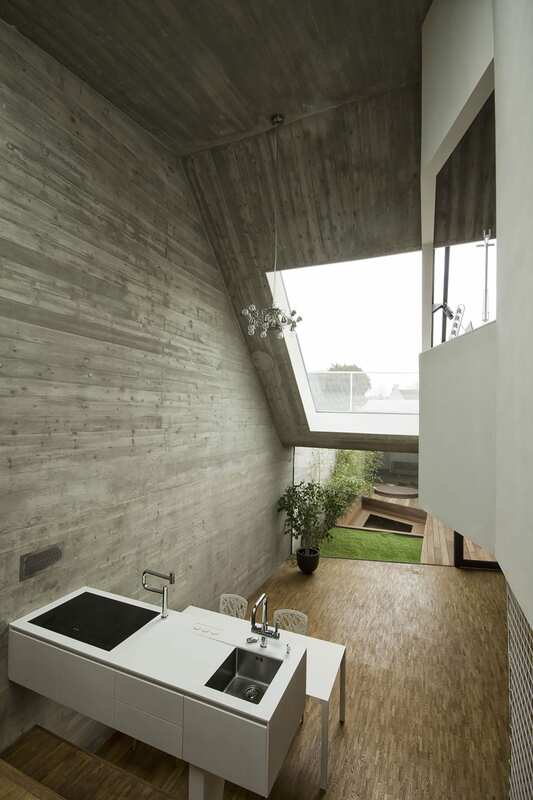 The concrete volume of the house has triangular corners carved away which create a sense of openness and spaciousness within the interior. 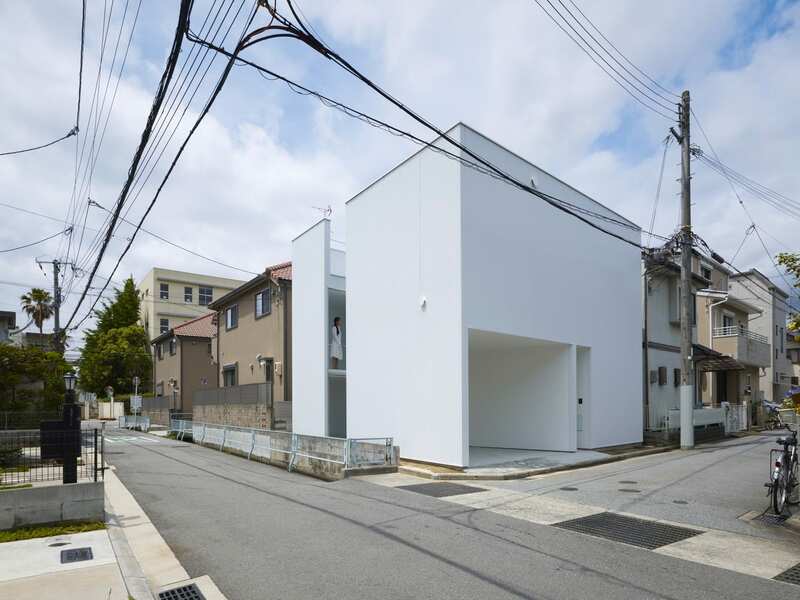 Re-slope House in Kobe, Japan by Tomohiro Hata // Embedded within a sloping block of land, this house follows the site’s sloping gradient with interiors also configured across three open-plan terraced platforms. 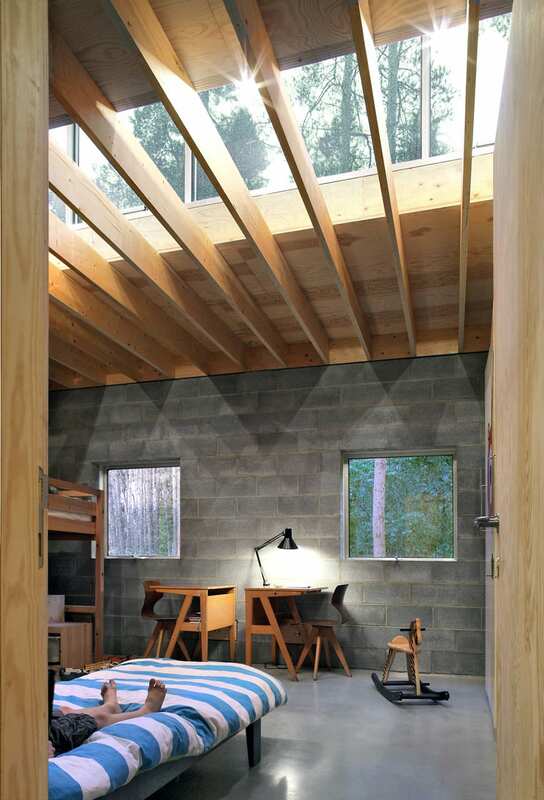 Large skylights illuminate all of the interior levels, and open up to the views of the trees above. 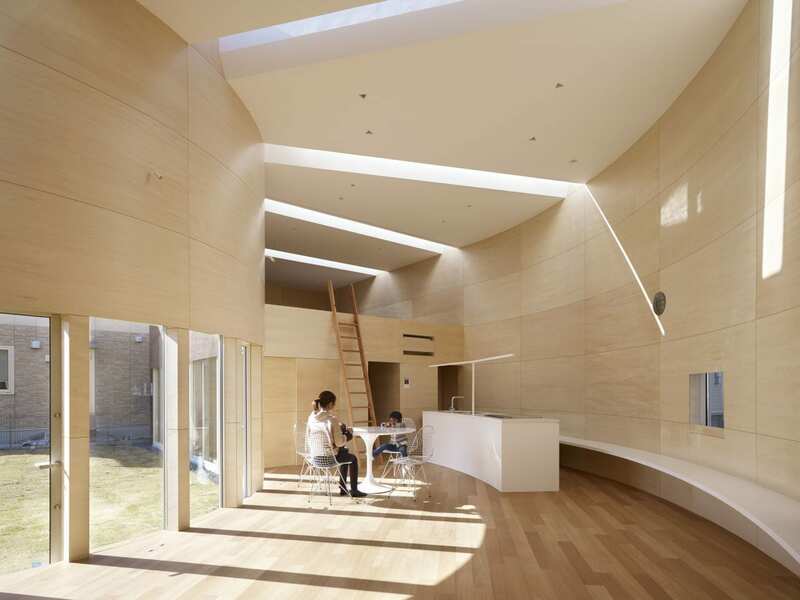 Light Valley in Kyoto, Japan by Future Studio // This house for a young family features a series of radial strip skylights in the ceiling, which allow different quality, colour and intensity of light into the room depending on the weather, seasons and time of day. 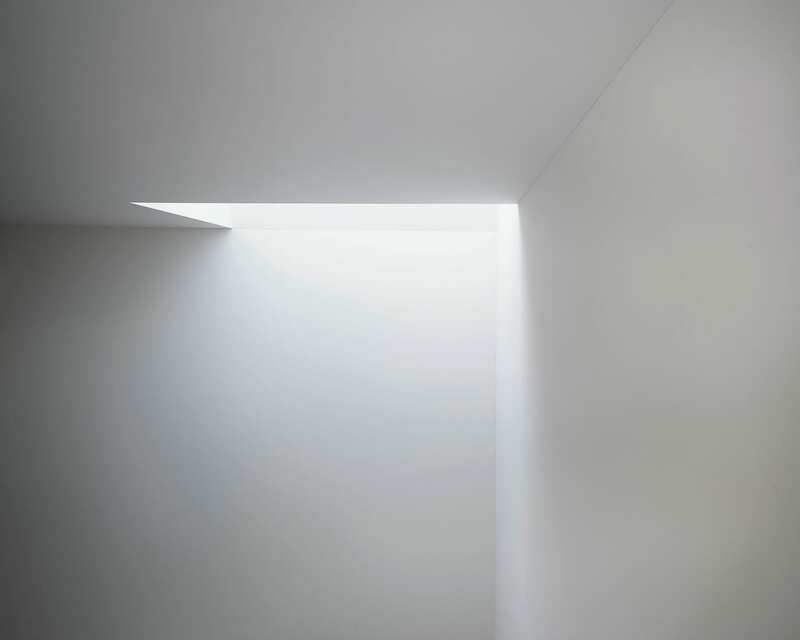 Light lines appear clearly on a fine day, and on a cloudy day, the lines vanish, while dim and vacuous light fills the room. From morning to afternoon to evening, light lines cast change with time. Just like the sundial, the many faces of light enable the residents to feel the passing of time. Photography by CreatAR images, CHEN Hao & SU Shengliang. 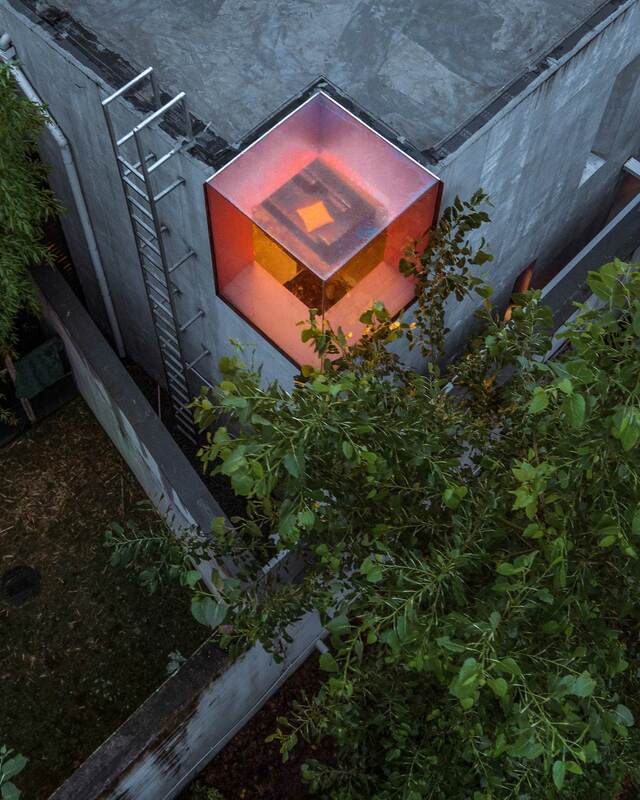 Artist’s House in Shanghai, China by Wutopia Lab // Lit by an array of skylights and windows, this house’s impressive lighting narrative culminates in the living room. 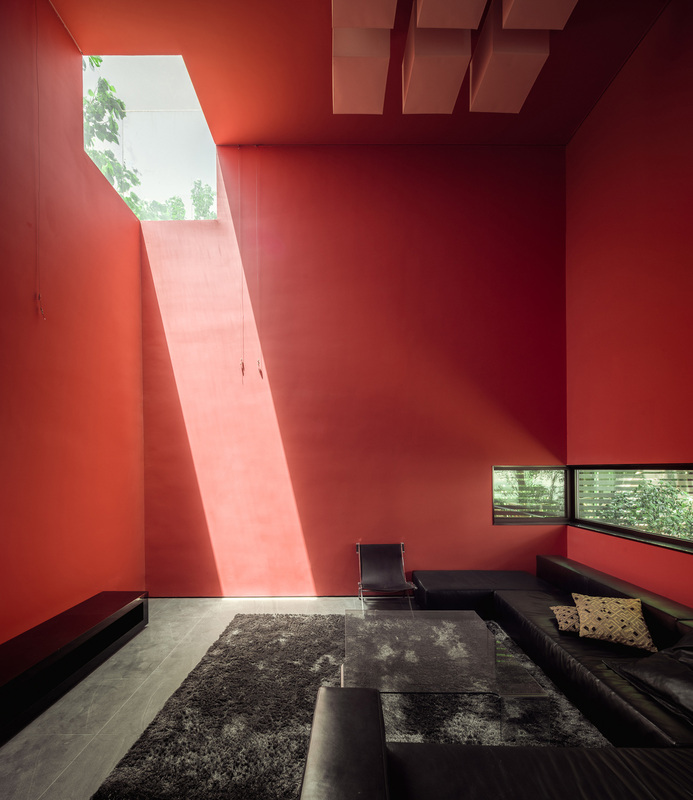 Light falls across the red painted walls from a glazed corner window accentuating the large volume of the room and creating a dramatic effect. 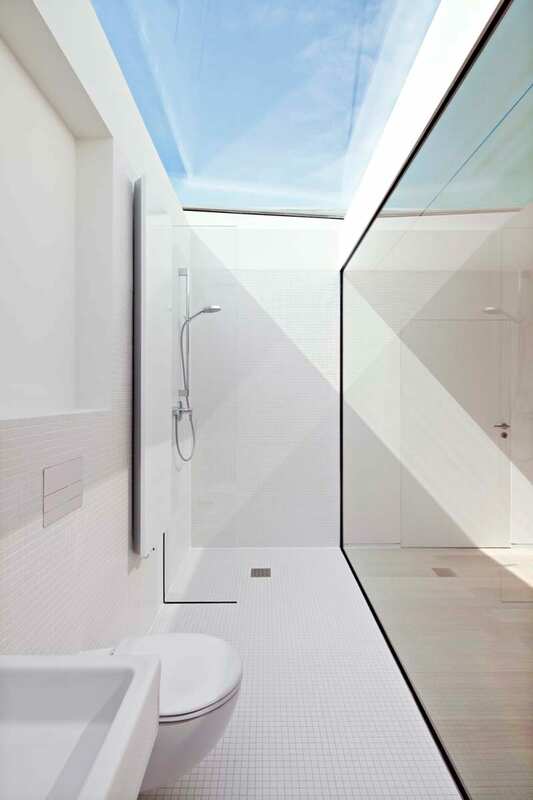 Sorel Residence in Canada by NatureHumaine // Southern light is brought into this family home by two majestic skylights positioned at the centre of the house. 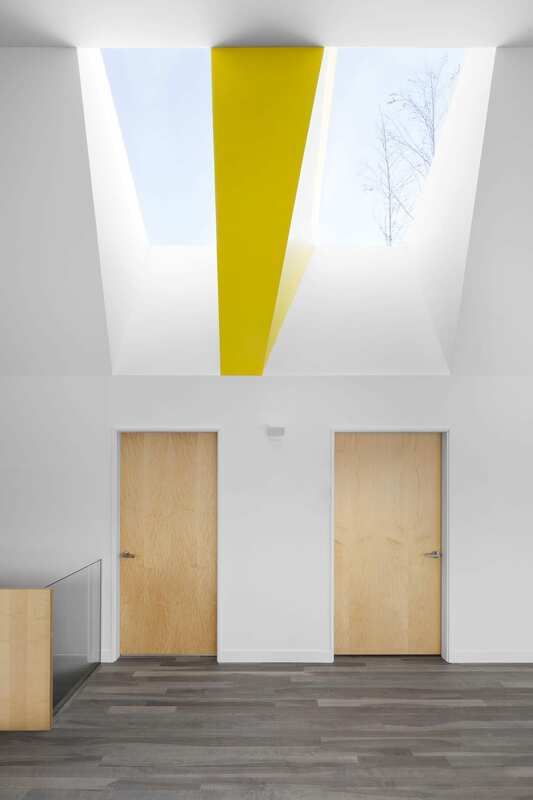 An angular yellow volume dividing the two skylights both warms the light, and diverts its direction. 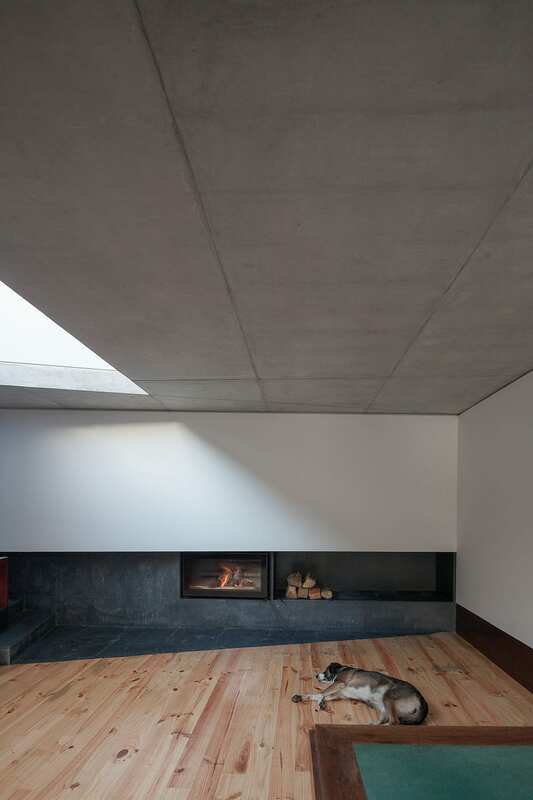 Slab House by Bureau de Change Architects // Concrete waffle roof which sits above the new living area of a period residence dubbed Slab House. The underside of the new roof is exposed to create the living room ceiling, its pronounced ‘beams’ created by the sunken roof planters above. 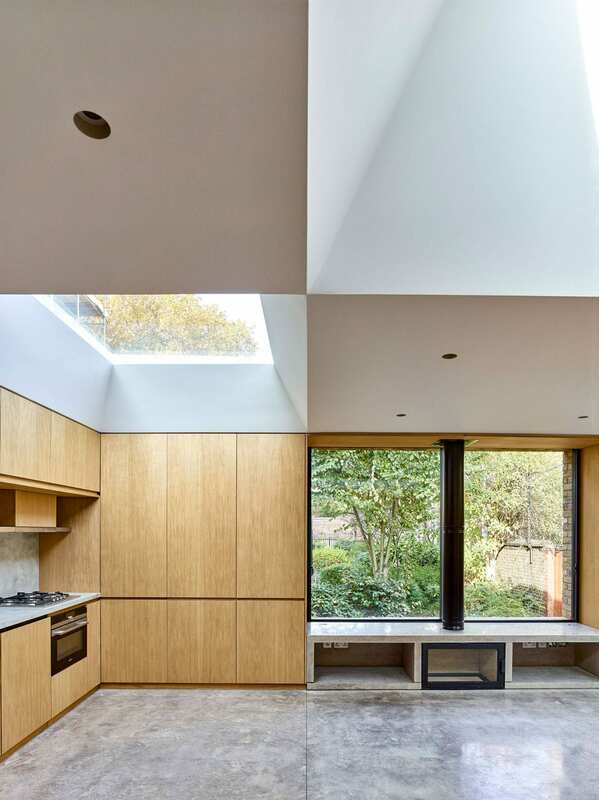 The motion of the waffle ceiling creates a satisfying rhythm, which also offers a logical position for a substantial skylight that traverses the full width of the extension. 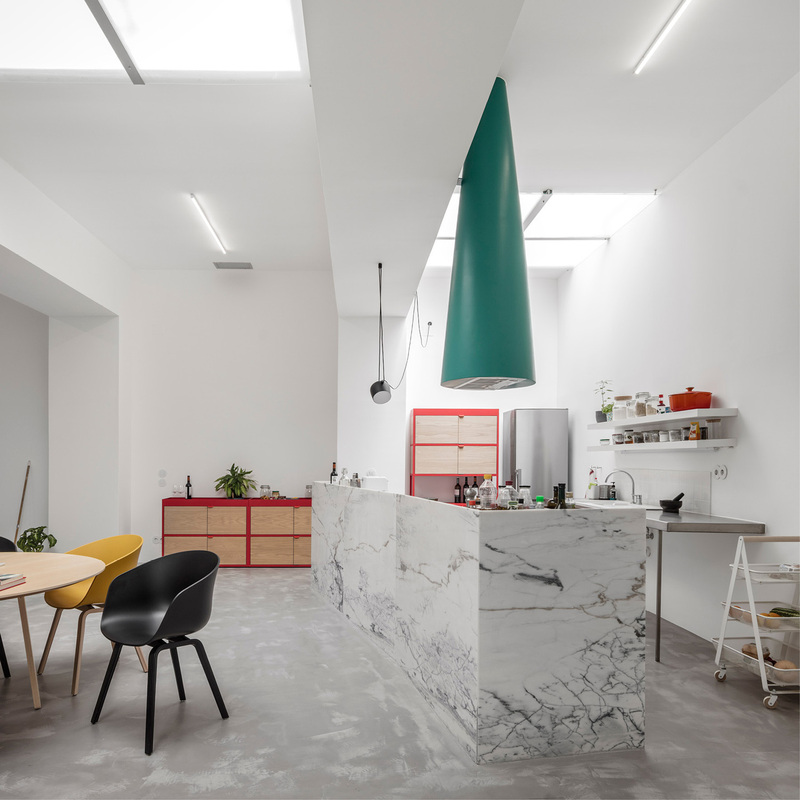 This strip of natural light illuminates the kitchen, which would otherwise be overcast by its position, set back within the footprint of the original house. 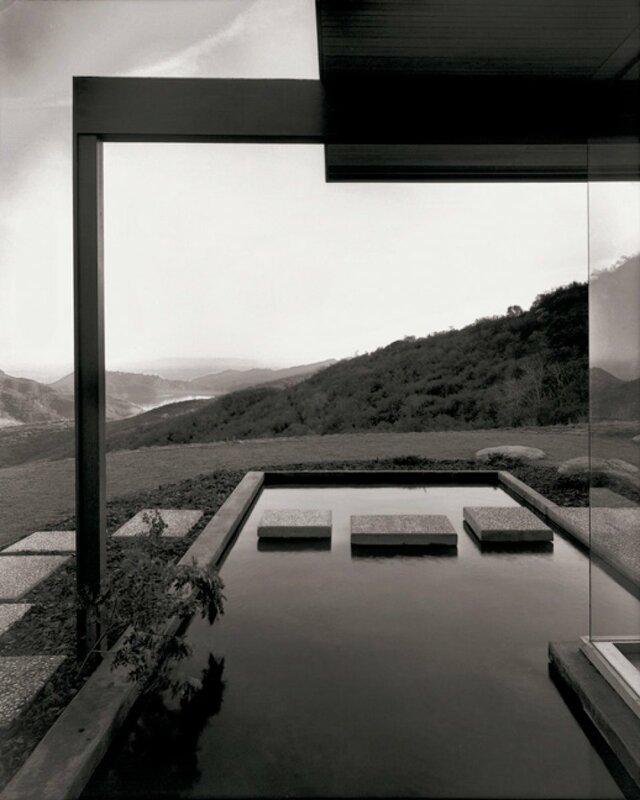 Photography by Fernando Guerra | FG+SG. 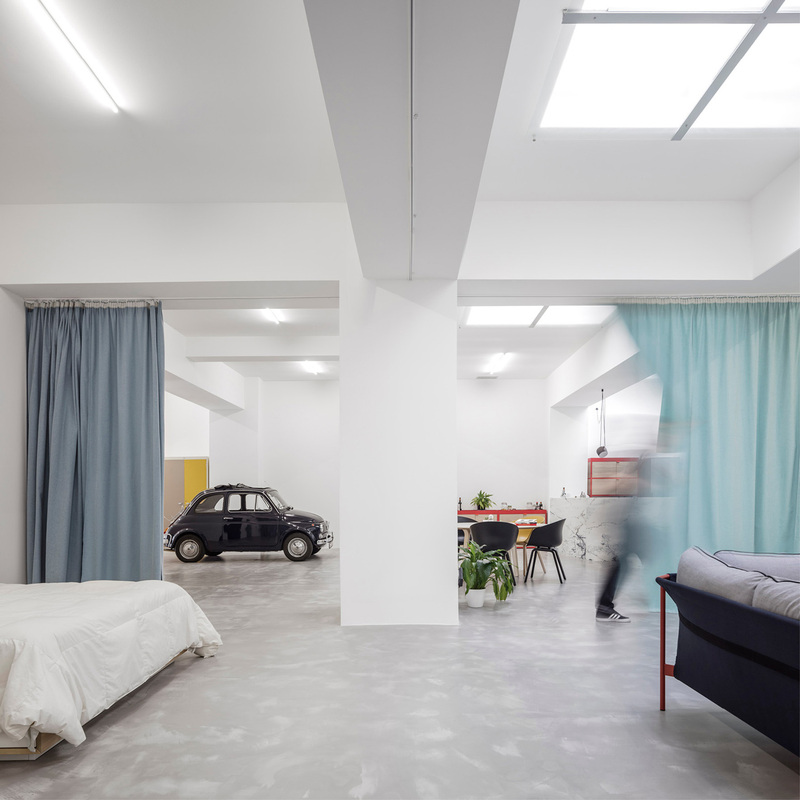 Garage House in Lisbon, Portugal by Fala Atelier // This renovation project started with an unconventional request from an open-minded couple within a very tight budget – to convert a windowless 200sqm garage in Lisbon into a house. 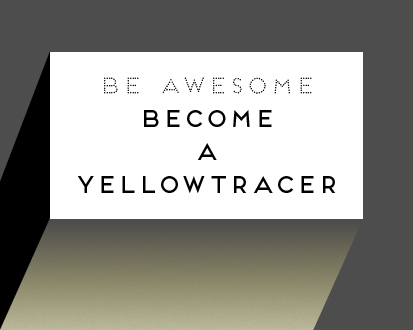 Sure – why not? The proposed intervention creates a crystal clear experience of the existing structure, with real emphasis on its robustness and strength. 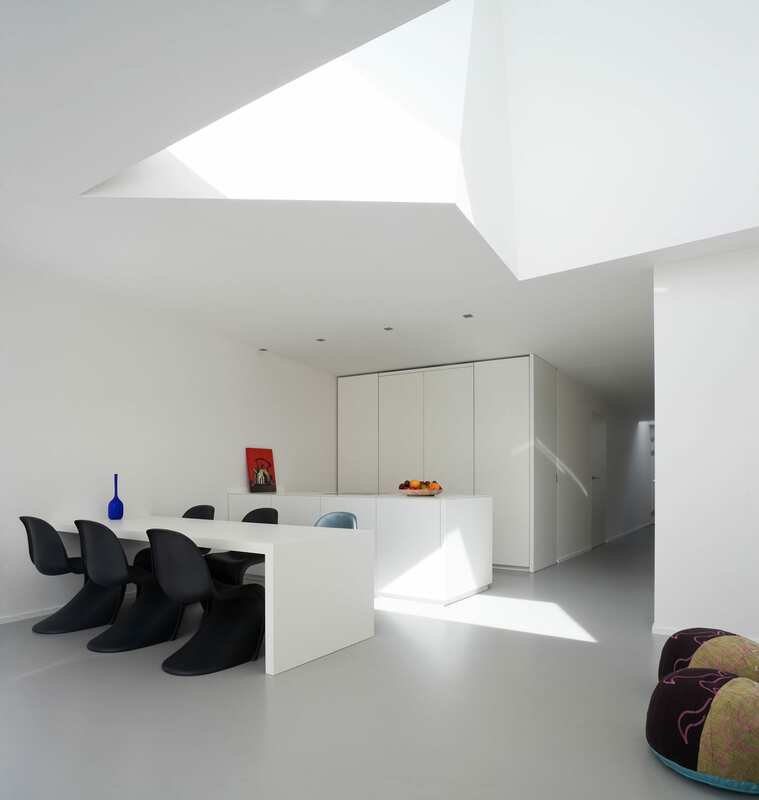 While the garage used to be untidy and grey, the new house appears clean and white – it’s materiality is flat, and its light quality is abstract, thanks to the cleverly positioned skylights. 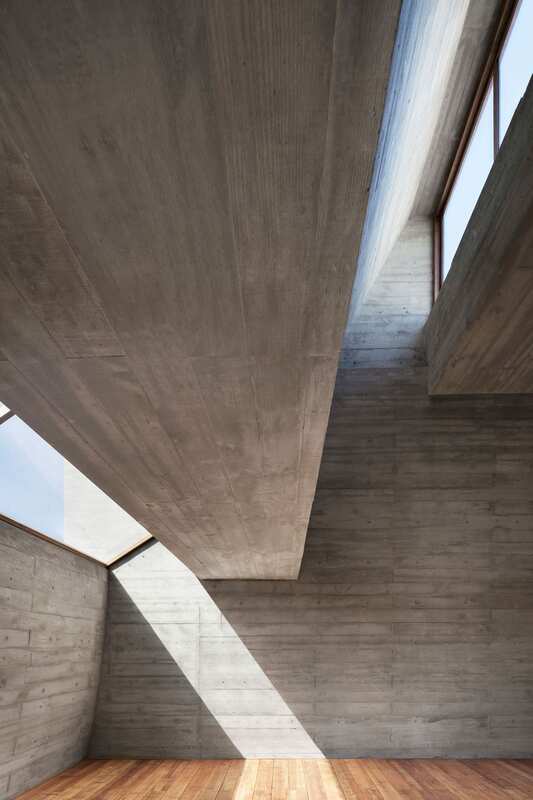 Pala Living Room in Penafiel, Portugal by Nuno Melo Sousa // This single story extension in Portugal features a striking triangular light-well, which extends upwards from the roof of the living room. Photography by 陈颢 Chen Hao. 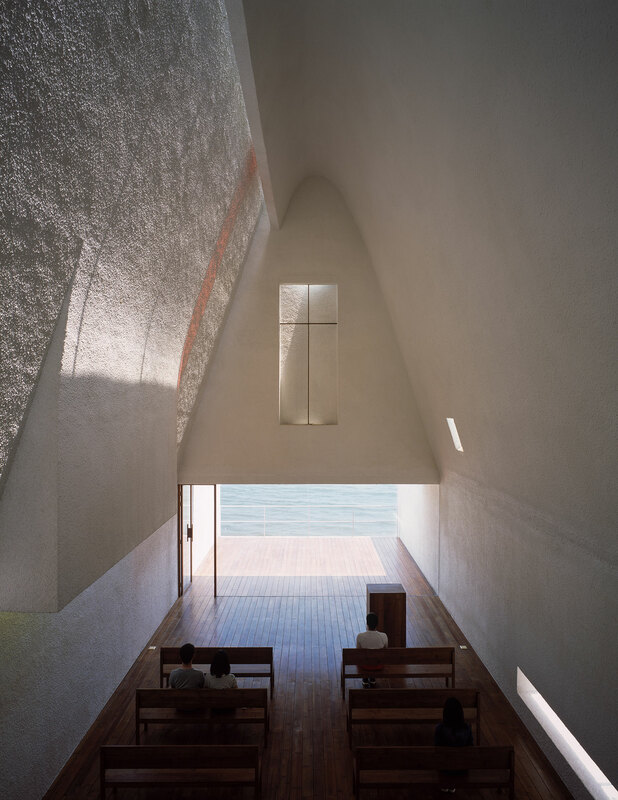 Seashore Chapel in China by Vector Architects // Imagined as an old boat drifting on the ocean this chapel has limited openings inside the interior. 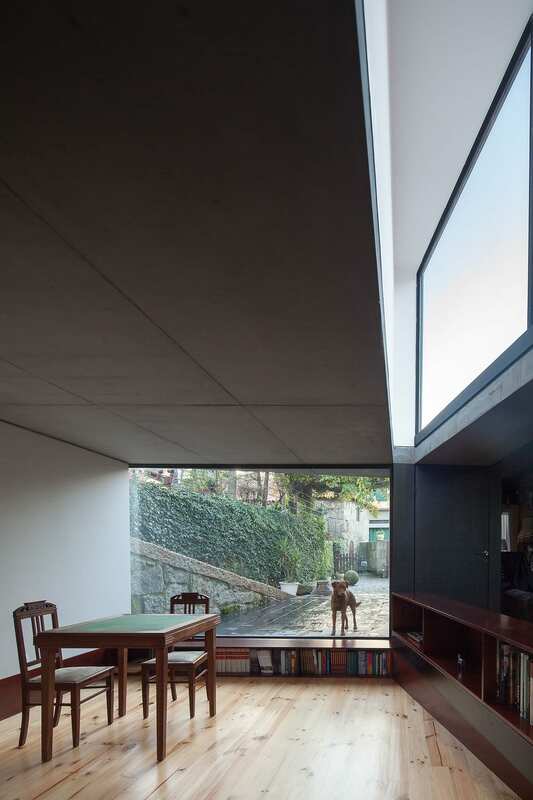 Apart from the large horizontal window facing the beach, a few narrow gaps between the walls bring the natural light in. 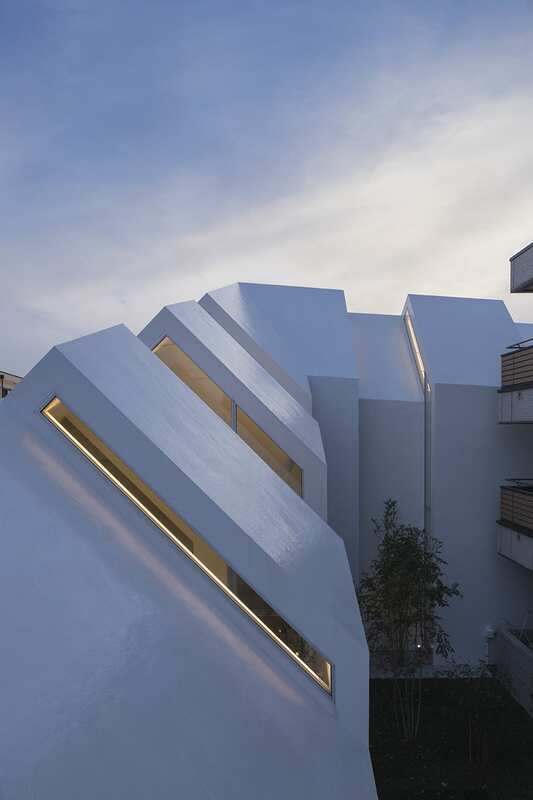 On the Eastern facade, a triangle opening gently illuminates the cross from the bottom and up. 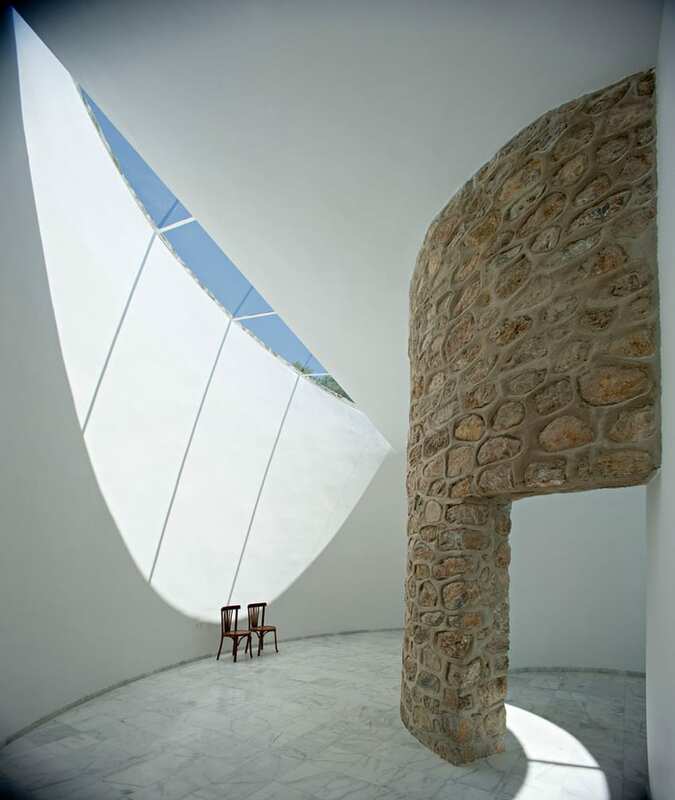 Another light channel sitting on top of the pitched roof allows the natural light to stream into the space via a small gap between the curved wall and the pitched roof. 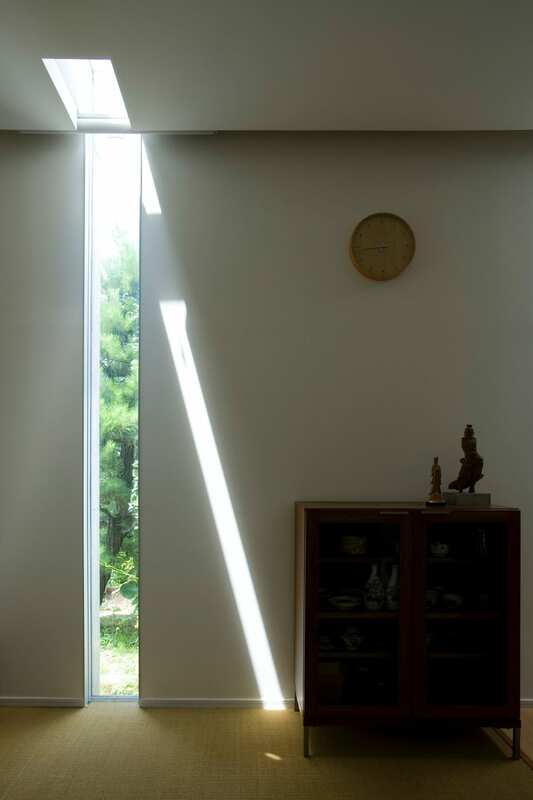 At the noon of spring, summer and autumn, when the solar altitude is almost perpendicular, the light projects directly onto the Northern wall, generating vivid lighting effect. Photography by Shinkenchiku-sha and Tetsu Hiraga. 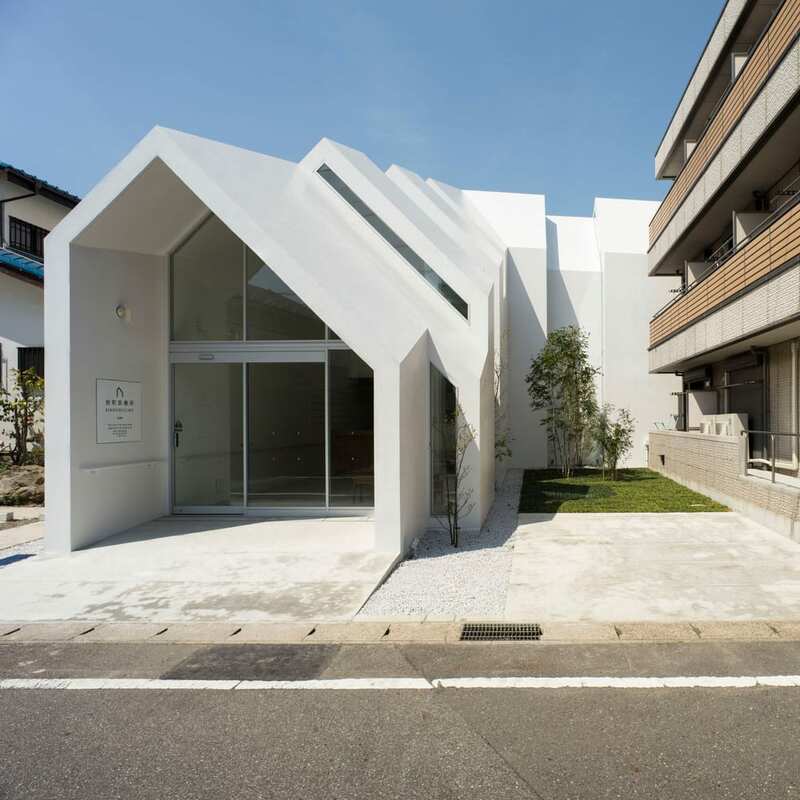 Asahicho Clinic in China, Japan by hkl studio // A sequence of house-shaped volumes separated by glass light wells mask the scale and purpose of this clinic which sits within a residential area of Chiba. Slivers of glass set between the irregularly shaped arches allow light to penetrate the building while restricting views through to the interior. 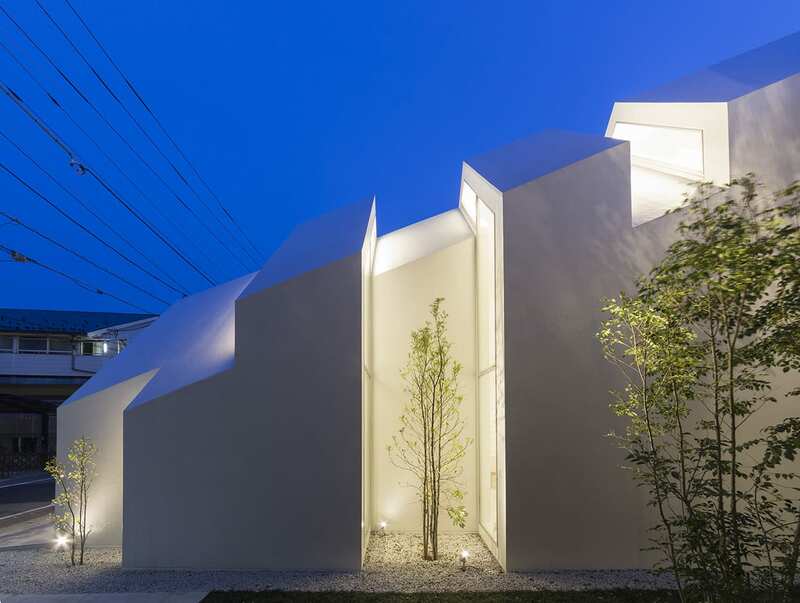 Slice of the City by Alphaville Architects // This house in Japan features a deep slice through its body, cutting the structure into two uneven sections. 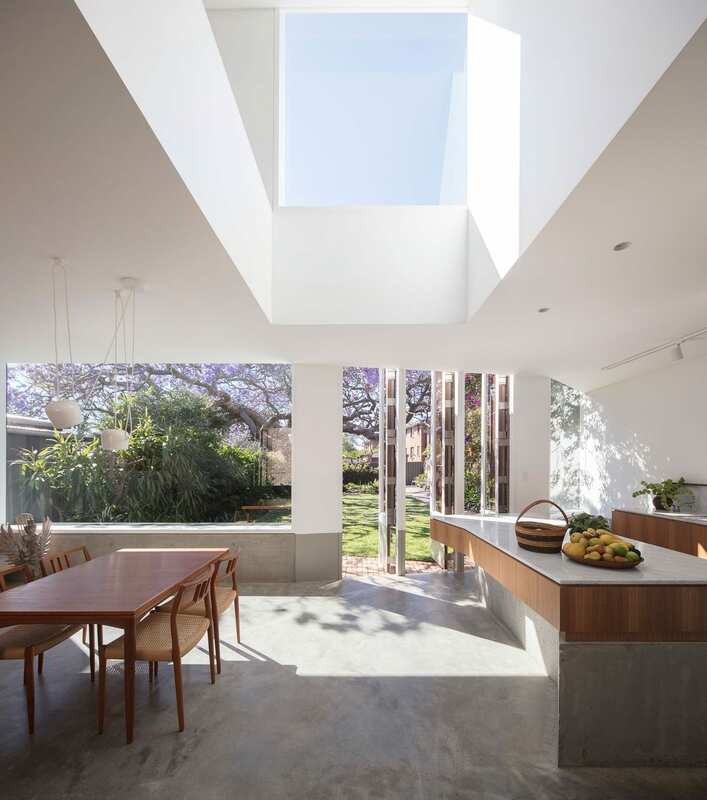 With neighbouring houses sitting no more than 1m apart, this strategy allows natural light into the centre of the home while maintaining privacy. 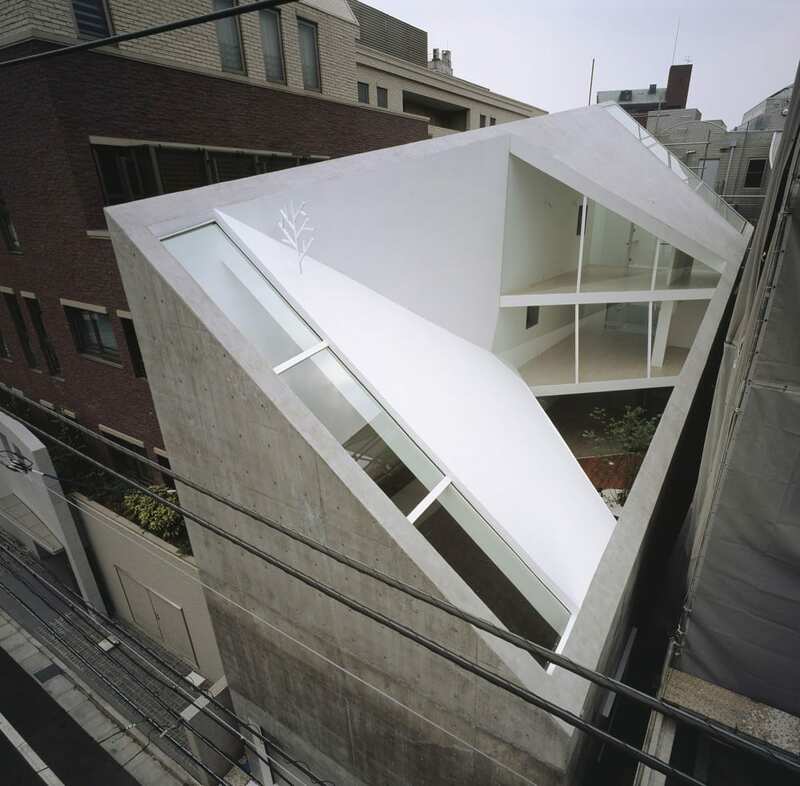 The slice creates a secluded courtyard at the centre of the house, while also bringing ventilation through the building. 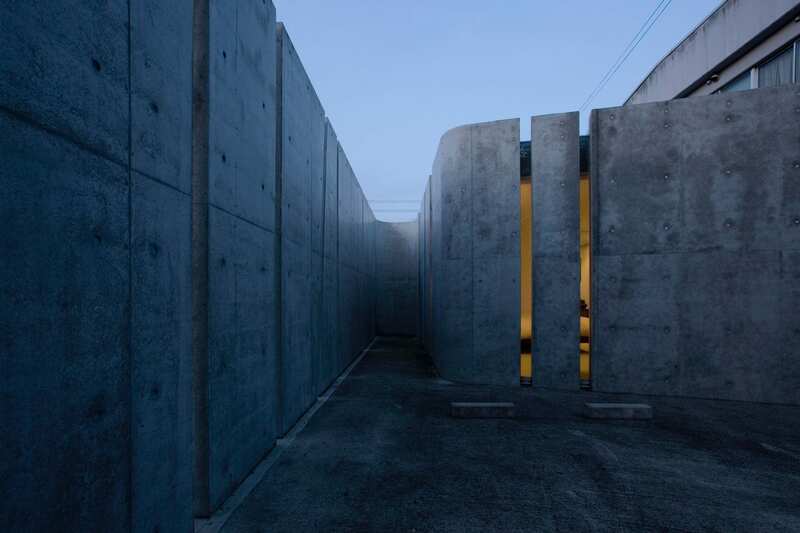 Slit House in Shiga, Japan by Eastern Design Office // More than 60 slits allow natural light to activate strategic areas of this house in Japan during the course of the day. 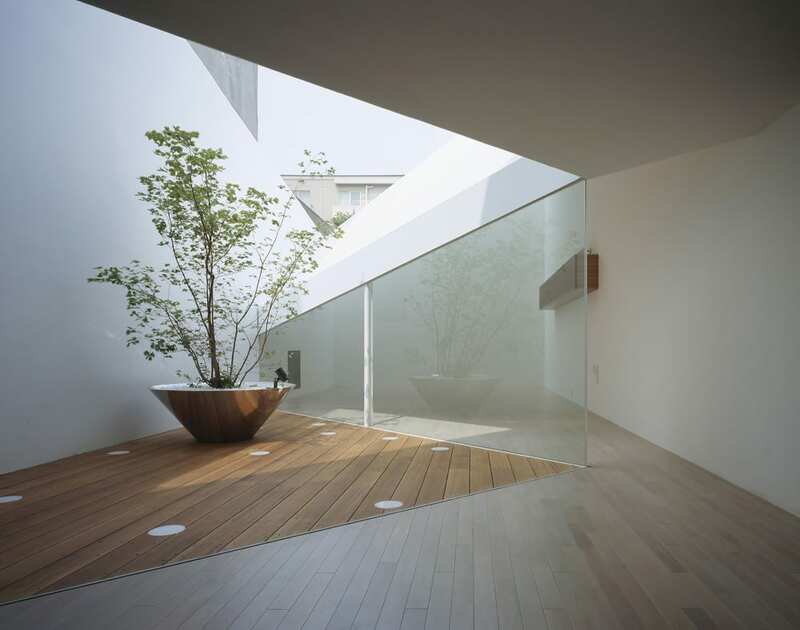 Glass is placed right into the concrete, without frames, and the light streams that shine through make reference to Fusuma or the Shoji (sliding doors used to separate rooms) in Japanese traditional architecture. “The slits make us more sensitive to light. 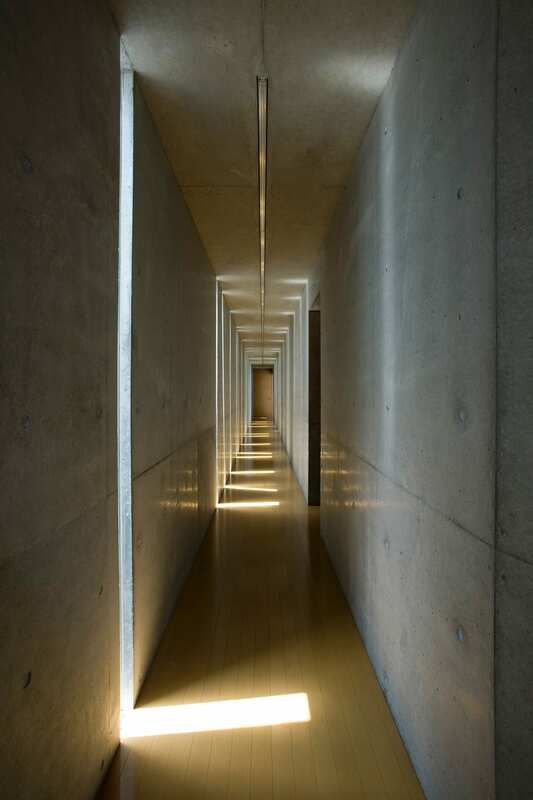 The interior space is light beyond our expectations. 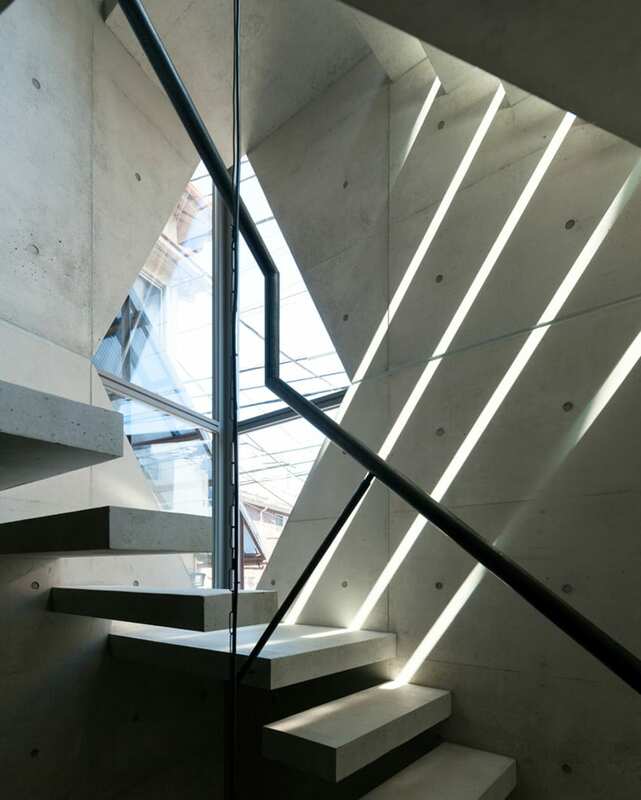 Light through the slits varies its appearance according to weather, season and time,” explained the architects. 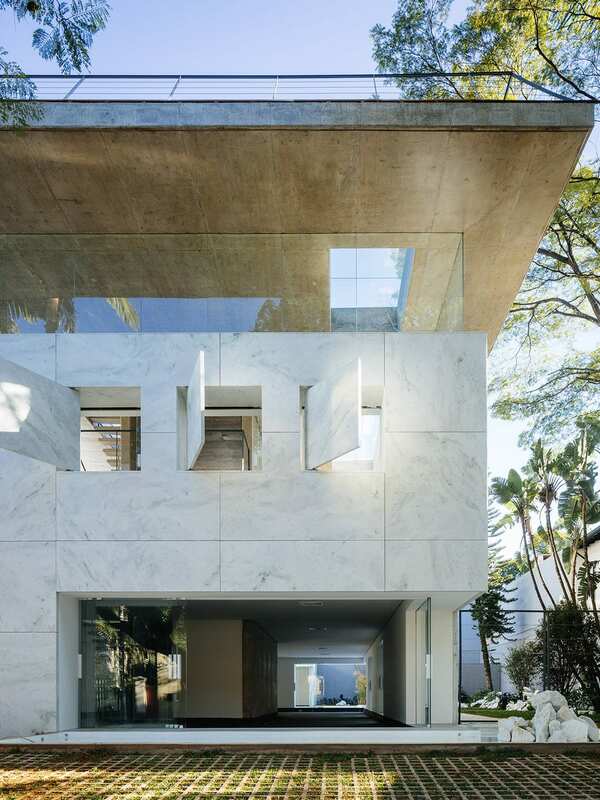 Groenlândia in São Paulo, Brazil by Triptyque Architecture // This commercial space in a chic neighbourhood of São Paulo defies the gravity, linking together stone and glass, rigidity and transparency, durability and lightness. 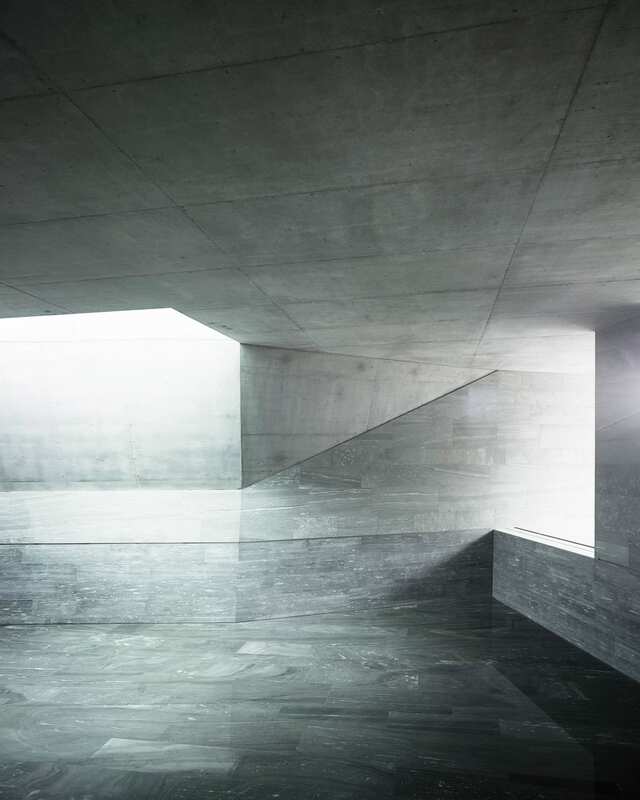 Villa Ensemble in Switzerland by AFGH // This sculptural concrete house was once a large single family home, now divided into two separate dwellings connected by the underground wellness area. 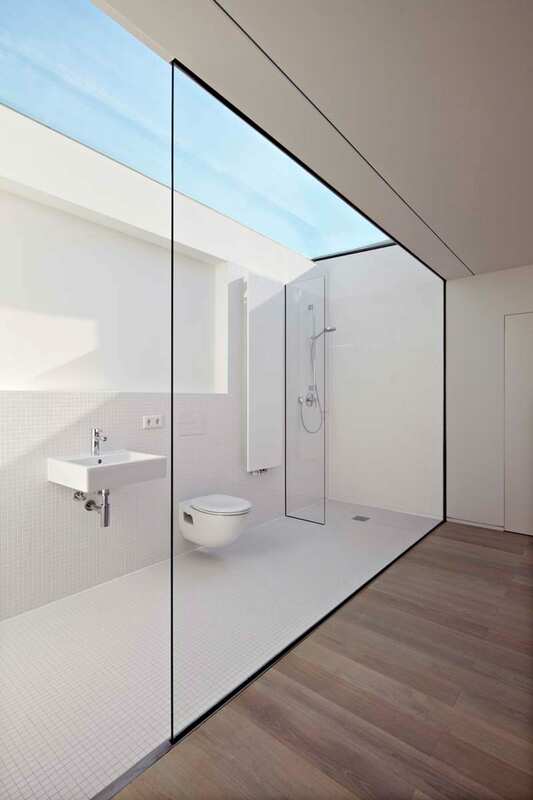 Skylights wash the interior with light located above each vertical circulation points. 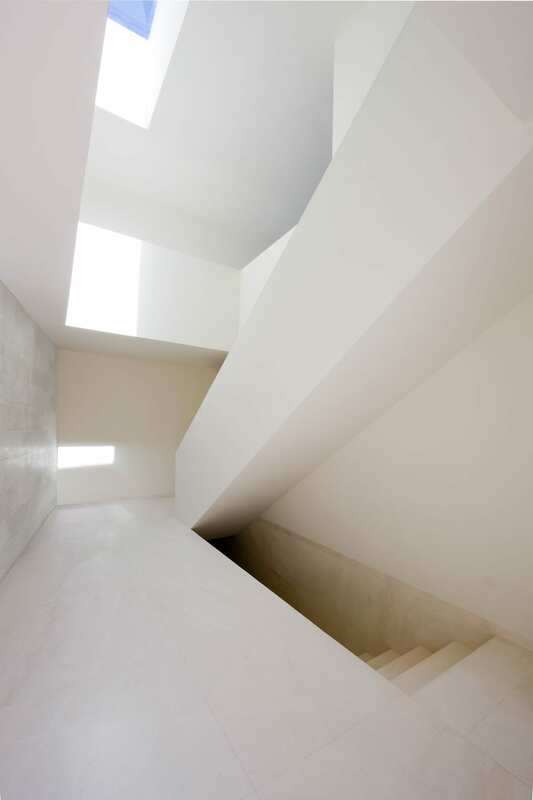 Aluminum House in Madrid by Fran Silvestre Arquitectos // To bring in plenty of light inside this two storey home in Madrid, Valencia-based Fran Silvestre Arquitectos designed a top-lit atrium that contains the staircase, connecting the two main floors with a basement level below. 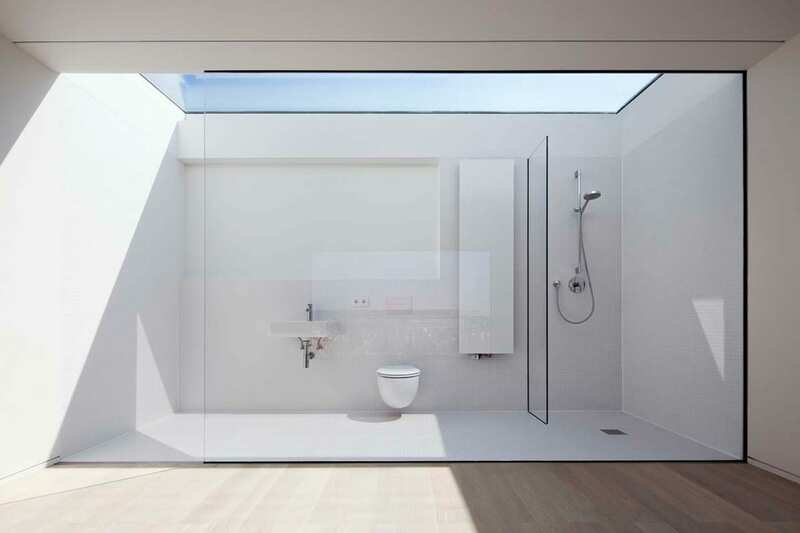 Haus W in Frankfurt, Germany by Ian Shaw Architekten // This house in Frankfurt exploits the building’s south-facing aspect with a fully glazed roof located above the wet room, creating a dynamic interplay of light and shadow. 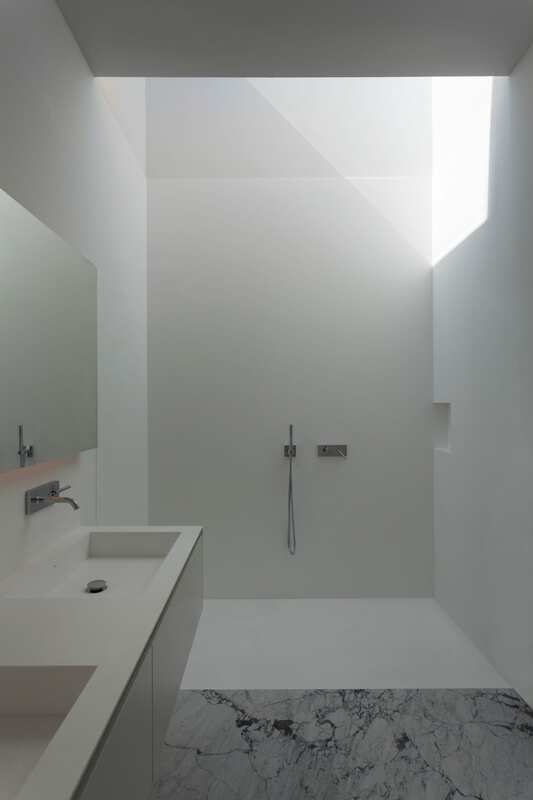 Cemetery Toilet Block in Ilhavo, Portugal by M2.senos.